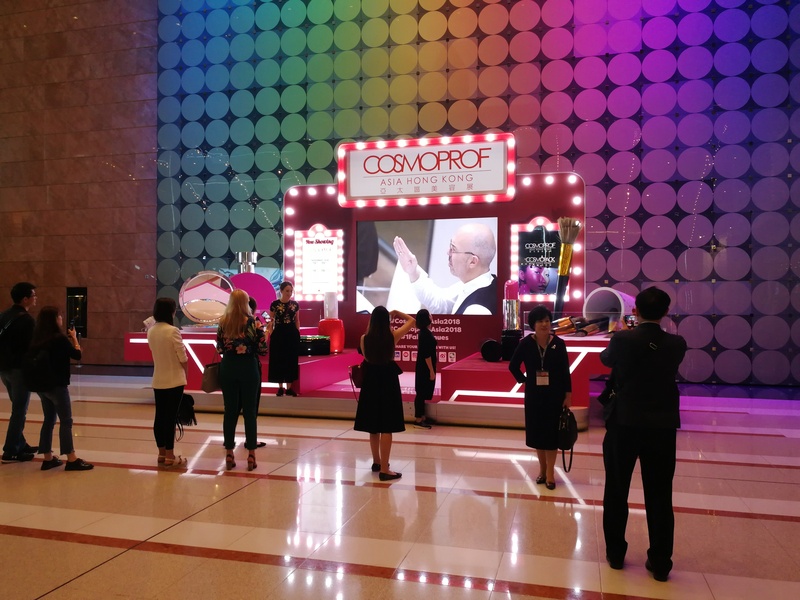 But first a few facts and figures about Cosmoprof Asia 2018: According to organisers UBM Asia and BolognaFiere, there were 3,030 exhibitors from 53 countries and territories across both sections of the show. I just checked last year’s stats and that’s a respectable 5% increase – in 2017, the official press release mentioned 2,877 exhibitors. 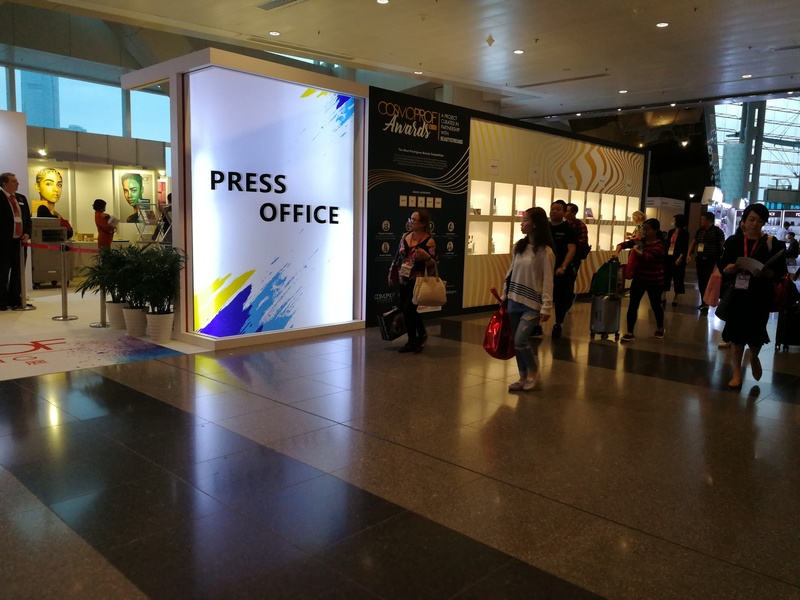 As a quick reminder: in 2016 the organisers decided to split the trade show into two thematic sections (“One Fair, Two Venues”) – Cosmopack (packaging, OEM/ODM, ingredients and manufacturing) was moved to Asiaworld Expo (AWE) near the airport while Cosmoprof (finished cosmetics, retail and salon beauty) remained at HKCEC in Wan Chai. Cosmopack always begins a day earlier than Cosmoprof (which finishes one day later than Cosmopack) to allow visitors to visit both parts of the trade fair. In 2018, the fair dates were 13th-15th November for Cosmopack and 14th-16th November for Cosmoprof. 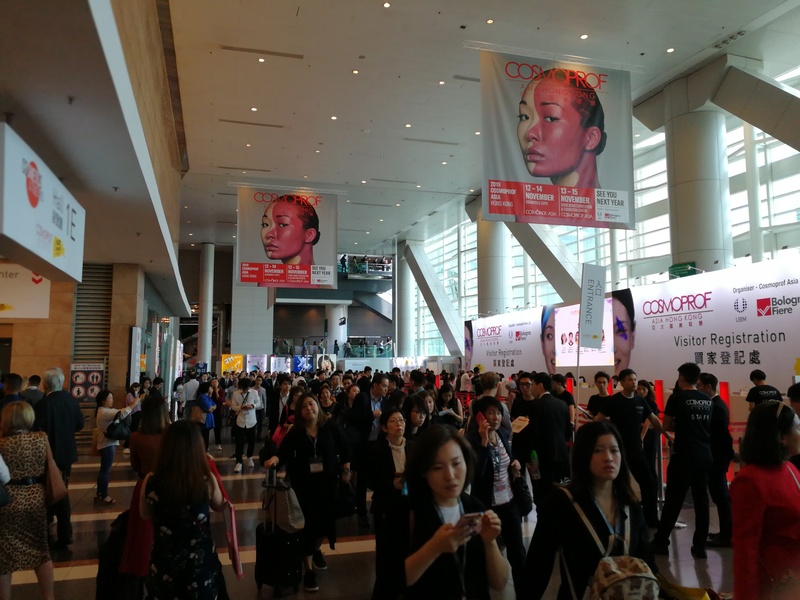 The majority of exhibitors – 2,127 exhibitors from 51 countries and territories – were at Cosmoprof/HKCEC while AWE’s Cosmopack hosted 903 exhibitors from 22 countries. Both locations offered a number of special attractions and features, like the Cosmolab initiative at AWE which (according to the press release) featured an AI robot which registered the trade visitors’s data about hair type and preference and then created a personalised shampoo sample based on this data. 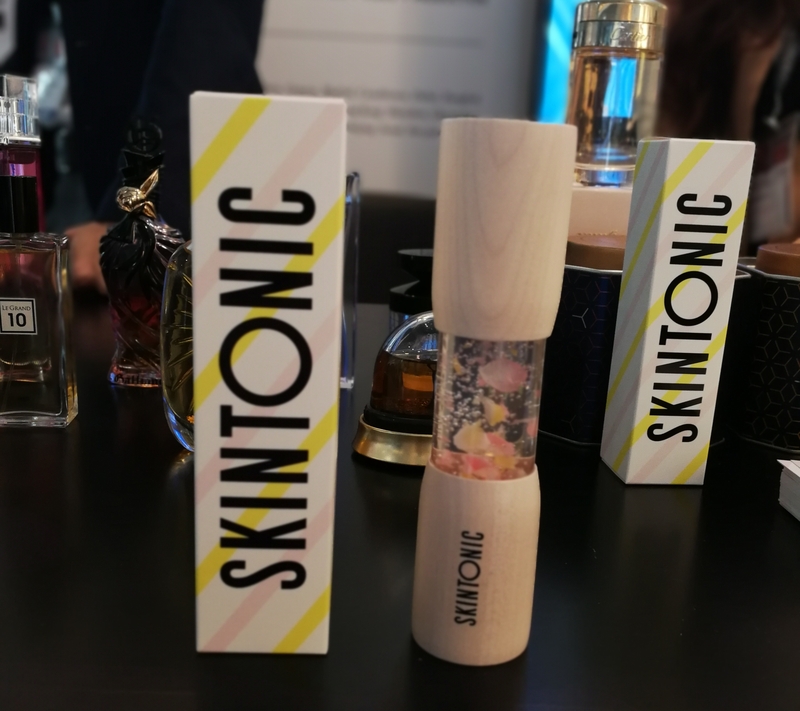 Another really interesting installation (which I would have loved to have seen) was this year’s Centdegrés installation: “Skintonic – The Factory”, a production line which allowed visitors to see exactly how a skin care serum is made and packaged. Luckily there was a Skintonic shop at HKCEC so I at least got to try the finished serum ; ) – see pics below! The exhibition floor space grew 5% compared to 2017, the organisers said, reaching a total of 113,800 sqm. The number of visitors increased a well, with a total of 87,284 attendees from 135 countries visiting the trade show, a 5% increase compared to 2017. The majority of trade show visitors (62,964) came from overseas which equals a 3.2% increase whilst the number of domestic visitors grew 6.8% to 24,320. 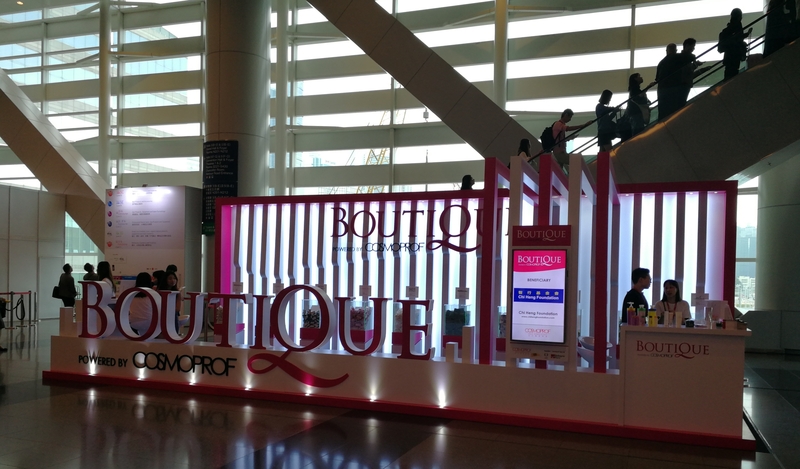 There were 24 country pavillions this year; plus all the Cosmoprof Asia features we’ve come to know and love: the Boutique charity store initiative (see pics below) which took place for the fifth time (you can buy sample sizes of selected beauty brands from participating exhibitors, with all proceeds going to a Hong Kong-based charity) and the 2nd edition of the Natural & Organic zone in Hall 3G (one of my favourites, needless to say). 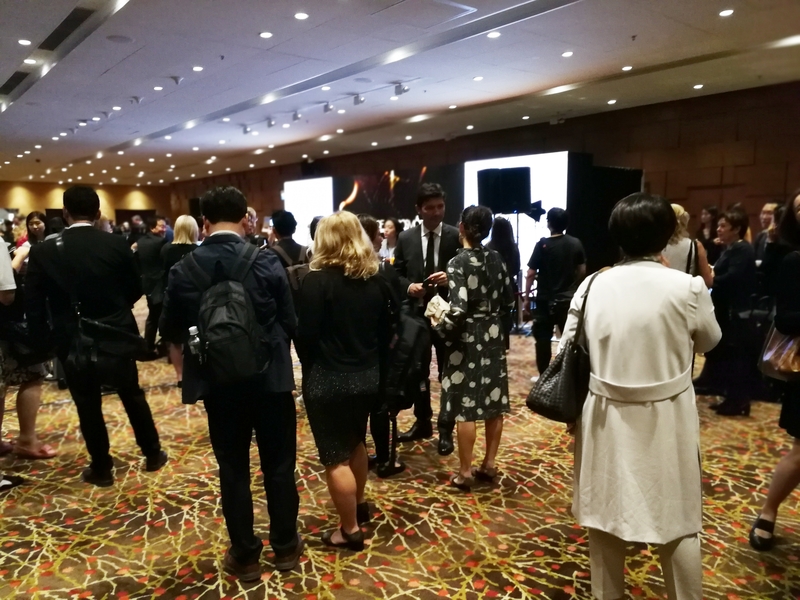 There was also an entirely new section at HKCEC this year: On Hair, a 2-day event dedicated to Asia-Pacific’s hair and salon industry. 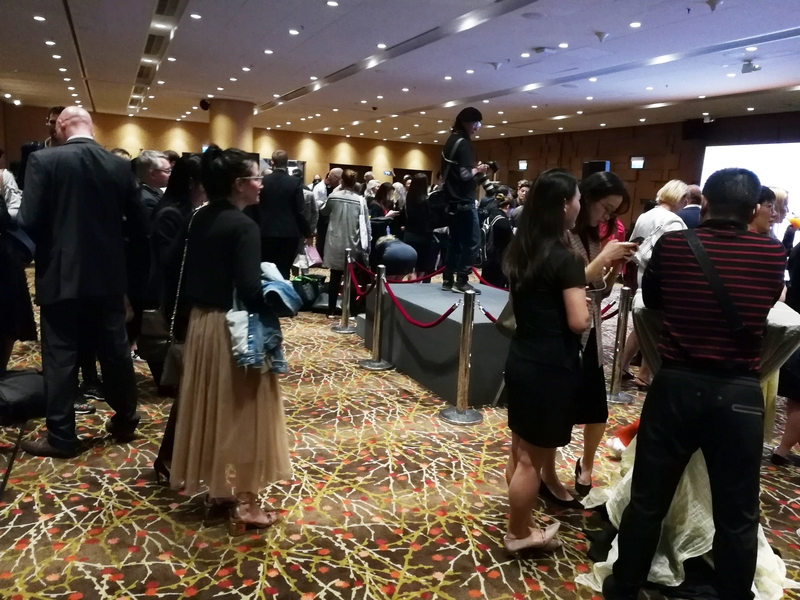 On Hair also featured the Hong Kong Hair & Arts Styling Festival 2018 and the Hong Kong Professional Nailist Union Competition 2018 also took place during the show. I didn’t have time to visit On Hair – and I didn’t make it out to AWE either – because my focus lies on finished and retail cosmetics, new brands and organic beauty. 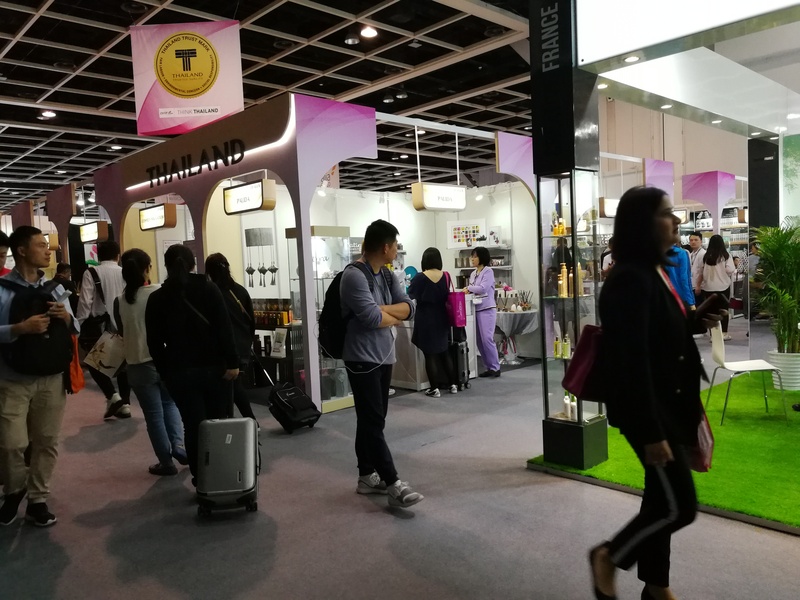 Hence my time at the trade show was spent at HKCEC, especially in Hall 1 (cosmetics & toiletries, perfumery), Hall 3G (natural & organic) and Hall 5G (new exhibitors in the C&T sector). 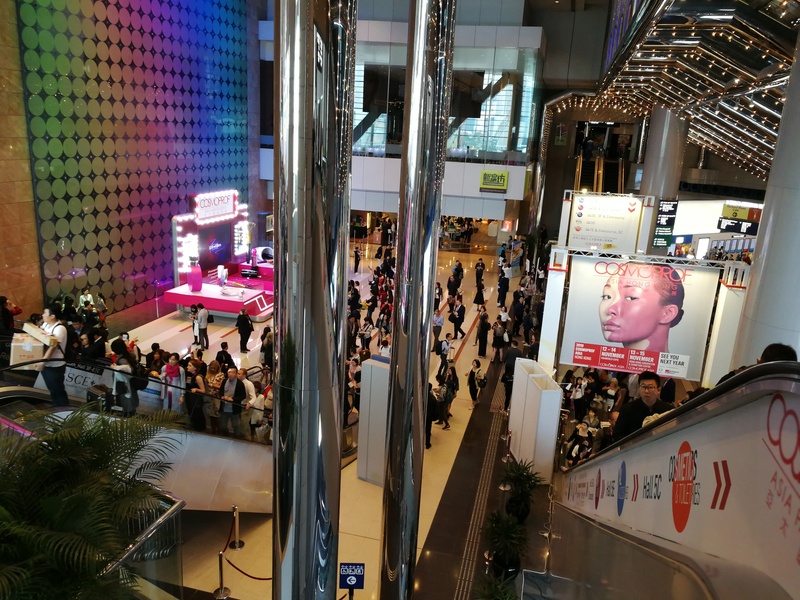 And before I forget: if you want to know what the previous editions of Cosmoprof Asia were like, check out my trade show reviews for Cosmoprof Asia 2014, Cosmoprof Asia 2015, Cosmoprof Asia 2016 and Cosmoprof Asia 2017. Anyway, now that the preliminaries are out of the way, let’s begin! The order of brands is, as usual, mostly arbitrary – I have sort grouped the green & organic brands together but the rest is a mixture of countries, product innovations and brand concepts; with mainstream and niche players, well-established brands and really new companies all in a wild jumble. Kind of like Cosmoprof Asia, actually. Skin Novels is a young artisan beauty brand from Romania. The company makes beautiful bar soaps (by hand) – their pièce de resistance is undoubtedly the gorgeous gold flake soap (which contains 24 karat gold leaf, see first pic below). 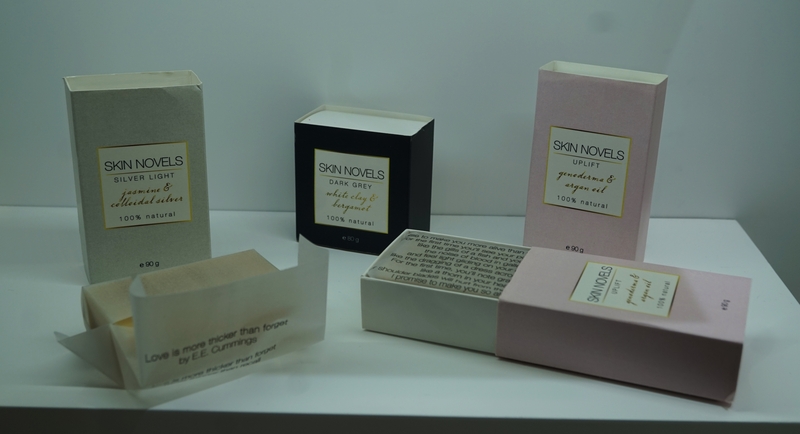 Skin Novels’ product portfolio comprises 11 bar soaps. I particularly like the packaging; the wrapping paper is decorated with quotes and poetry and the poem usually reflects the key ingredients or the product name. The company’s newest launches are two liquid products: a body wash which has been formulated with local thermal water, and a body oil with a pleasant dry-oil texture. 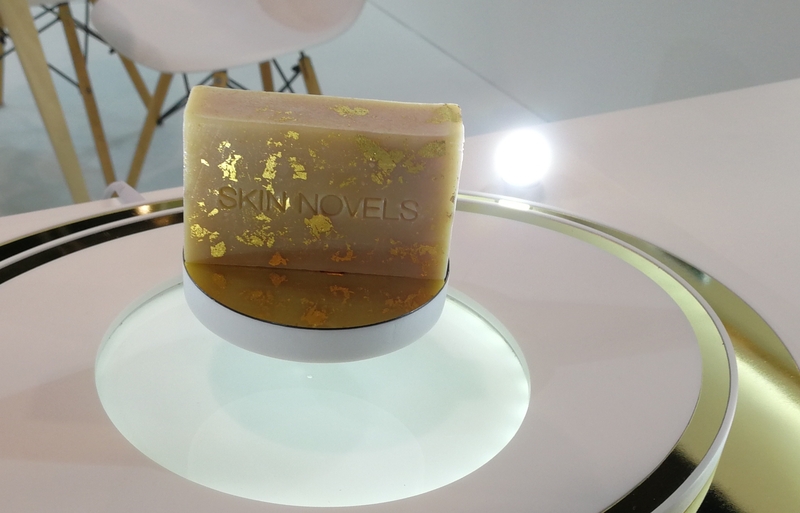 At the moment Skin Novels’ soaps are only available in perfumery chain ICI Paris XL in the Netherlands (and online, of course) but the company is looking to expand into the Asian markets. 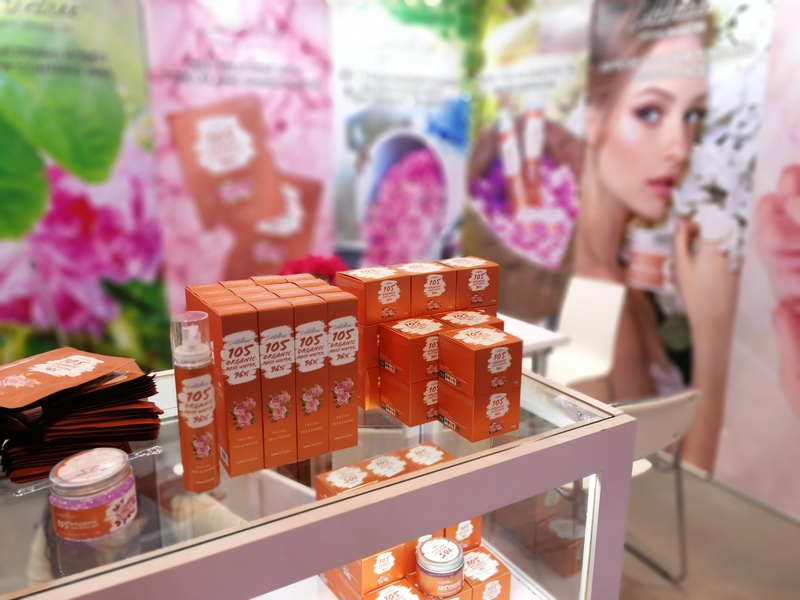 Organic rose beauty brand Alteya Organics from Bulgaria always presents a host of new launches at Cosmoprof Asia. 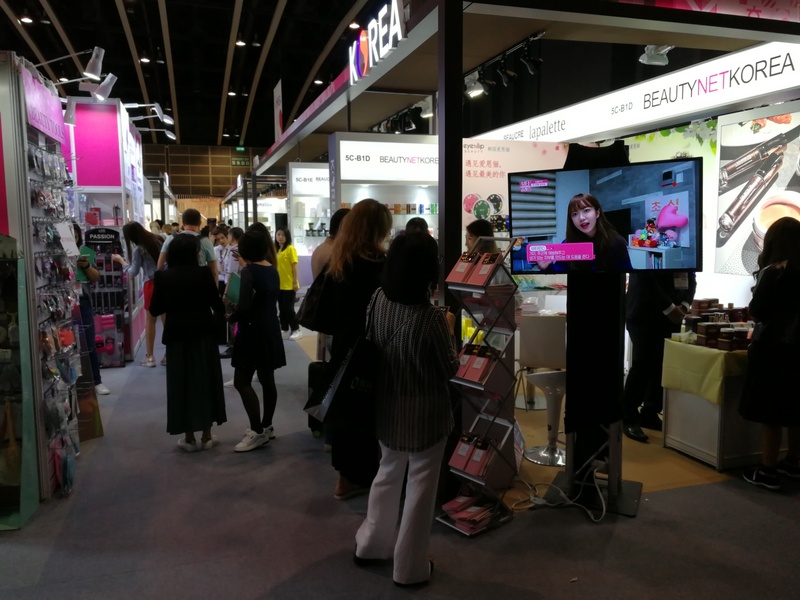 The brand’s really popular in Asia so Cosmoprof Hong Kong is one of their key trade show events. 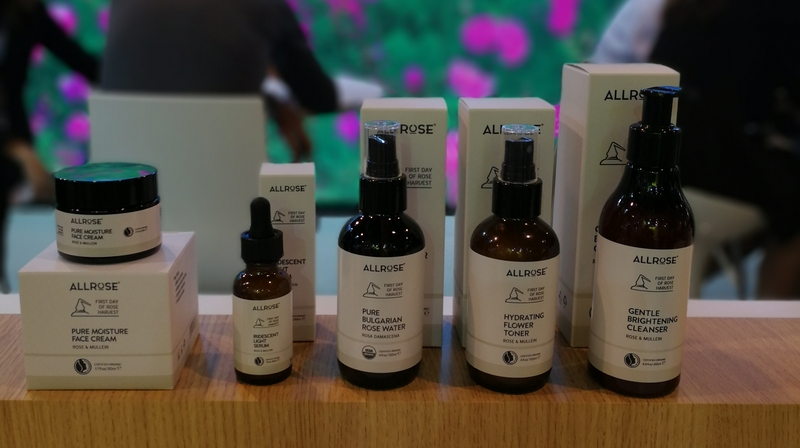 This year, Alteya showcased two entirely new ranges – the 5-sku Allrose range (see first two pics below) which is formulated with rose water and mullein flower extract to hydrate, soothe and brighten the skin, and the 5-sku Rose Harvest range (scroll down to the last two pics) which is built around rose extract and glasswort extract. 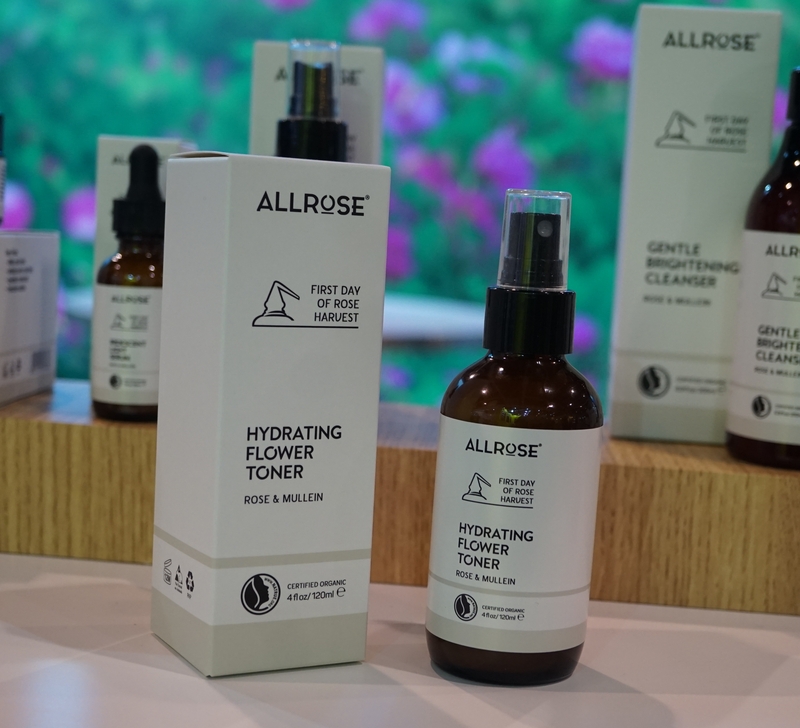 Both ranges start with a sulfate-free ge cleanser, followed by a pure rose water toner and a floral hydrosol, a light serum and a face cream. 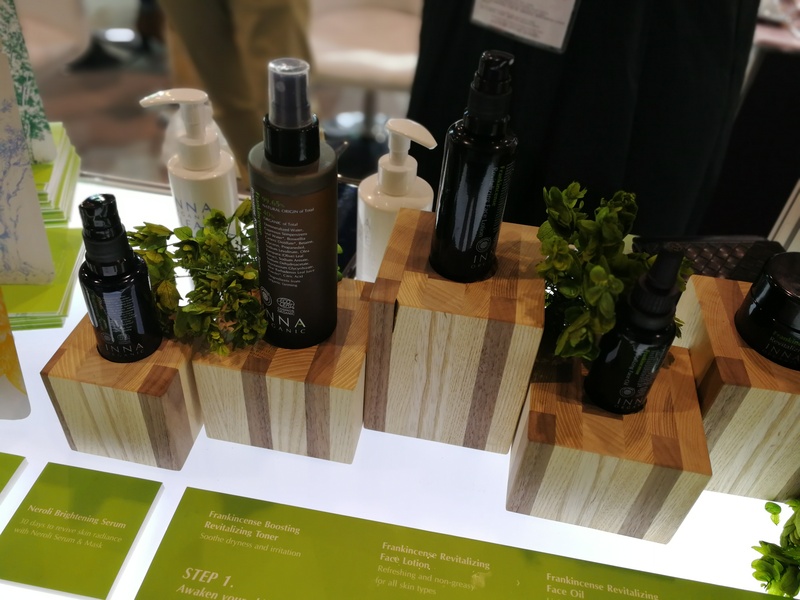 The two ranges will launch internationally in early 2019, starting with Alteya Organics’ Asian markets. 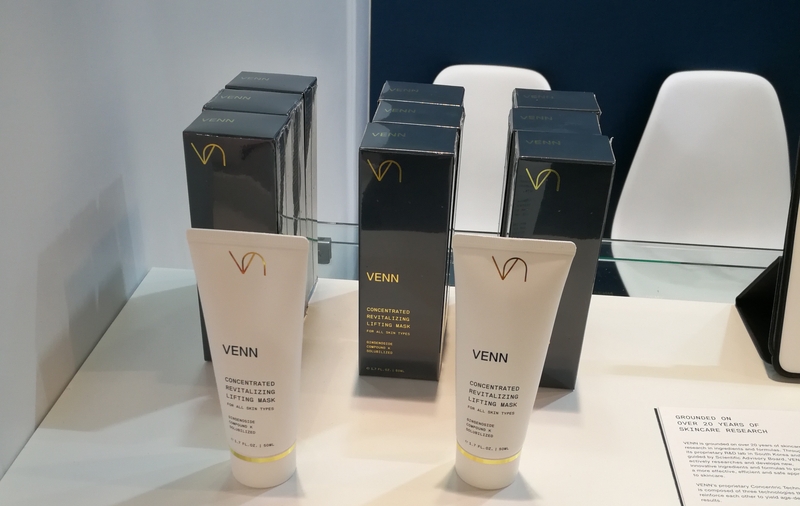 The company will also present the two ranges at Vivaness 2019, I was told, so if you’re visiting the show you’ll be able to check out the products. 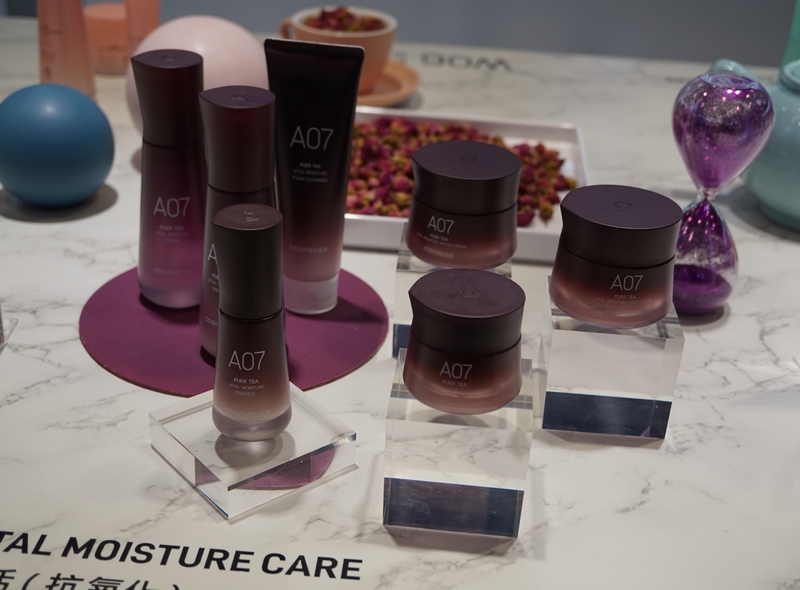 There might be some small tweaks to packaging and presentation – at the moment it is still uncertain whether the ranges will launch under the Alteya Organic brand or as a stand-alone lines – but the basic product concept will remain: two uncomplicated ranges of basic face care with a price range of around 12-30 USD – more affordable than Alteya Organics’ more high-end Rose Otto and Rose Jasminium ranges. 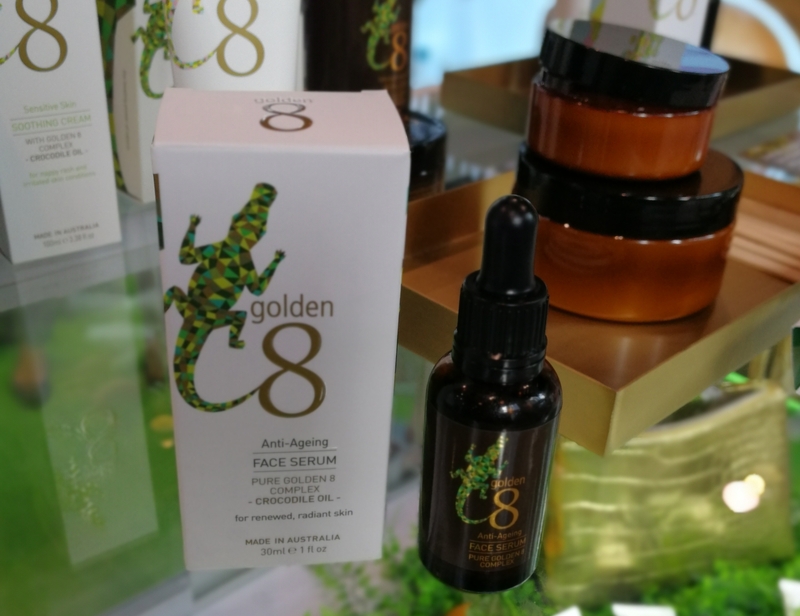 Australian skin care brand Golden 8 focuses on a rather unusual ingredient – crocodile oil. Yes, really. And Australia has a lot of crocodiles apparently; there are crocodile farms where crocs are raised for use in the fashion industry (handbags, shoes etc.). The crocodile oil is produced from the fat underneath the crocodile’s tail so it’s basically a by-product from the crocodile industry. Qnite environmentally conscious; a sort of snout to tail approach! The Golden 8 range comprises five products – a body lotion, body balm, hand cream, soothing face cream and face serum and derives its brand name from its star, the crocodile serum (see pic directly above) which contains just eight ingredients: crocodile oil, jojoba oil, passionflower seed oil, olive fruit oil, caprylic/capric triglyceride, ascorbic acid, beta-carotene, tocopherol and fragrance (the fragrance was added because pure crocodile oil has a rather bad smell). 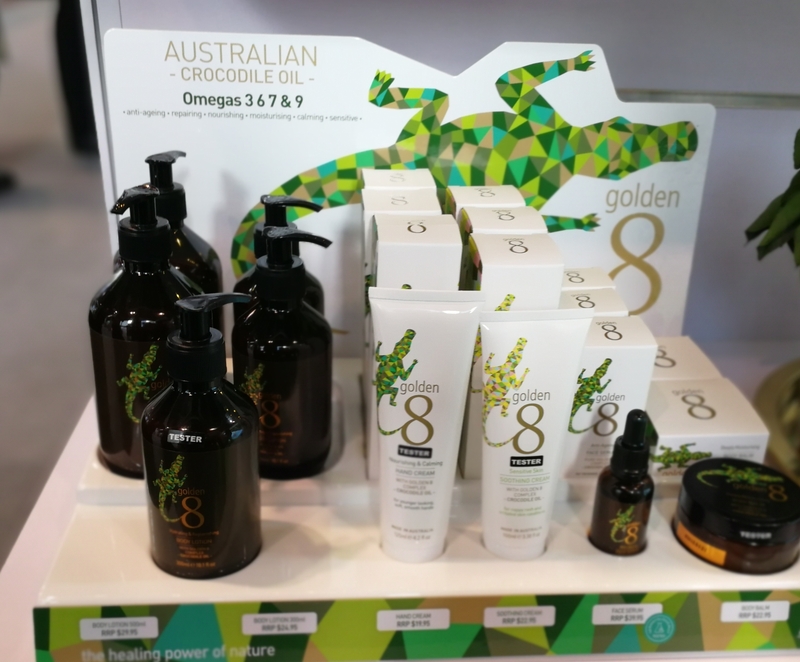 The brand was launched just six months ago, in March 2018, and the products are currently only available in Australia, However, Golden 8 has its sights set on Asia. There’ll also be two new products launches soon: a body wash and an anti-stretch mark cream. 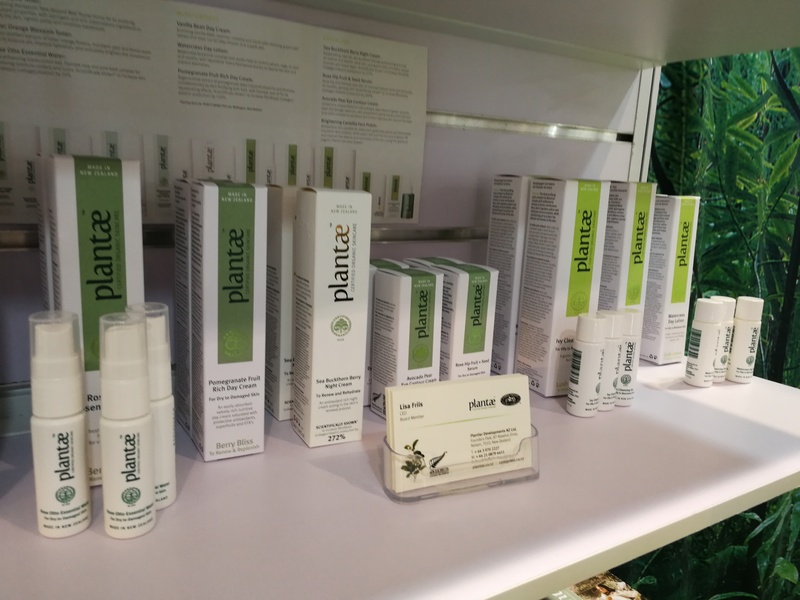 Plantae is a certified organic beauty range from New Zealand. 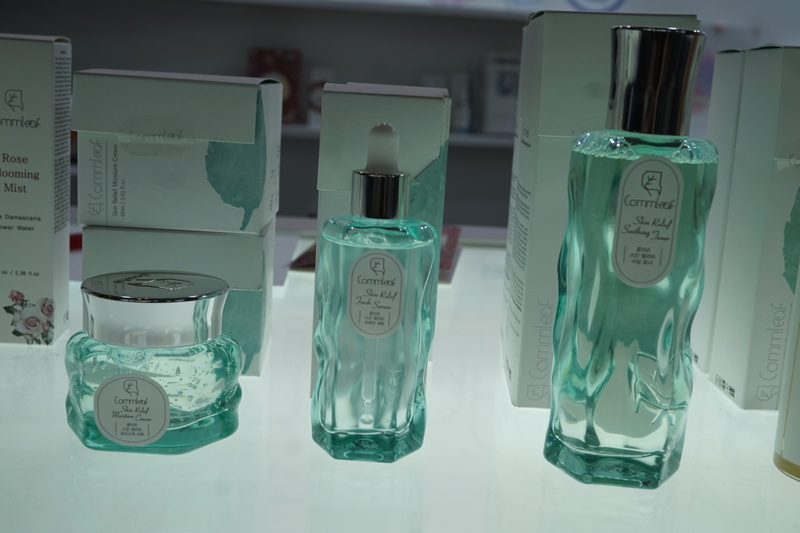 The brand was launched in 2011 and their 13-sku product line-up is divided into three lines: Lush Leaves offers an Ivy Cleansing Gel, Wild Thyme Toner and the Watercress Day Lotion while Flower Power comprises a Bergamot Orange Cleansing Milk, Bitter Orange Blossom Spritz, Vanilla Bean Day Cream and Brightening Camellia Face Polish. Finally, Berry Bliss includes the Pacific Blue Lavender Cream Cleanser, Rose Otto Essential Water, Pomegranate Fruit Rich Day Cream, Sea Buckthorn Berry Night Cream, Avocado Pear Eye Contour Cream and a Rosehip Fruit & Seed Serum. 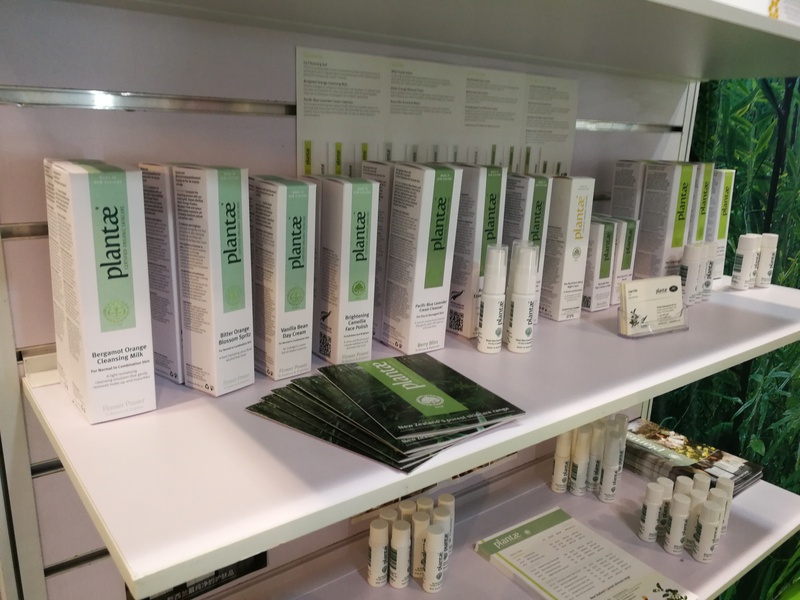 At the moment Plantae’s products are only available in New Zealand but the company is looking to expand into the East Asian marketplace, and eventually into Europe. 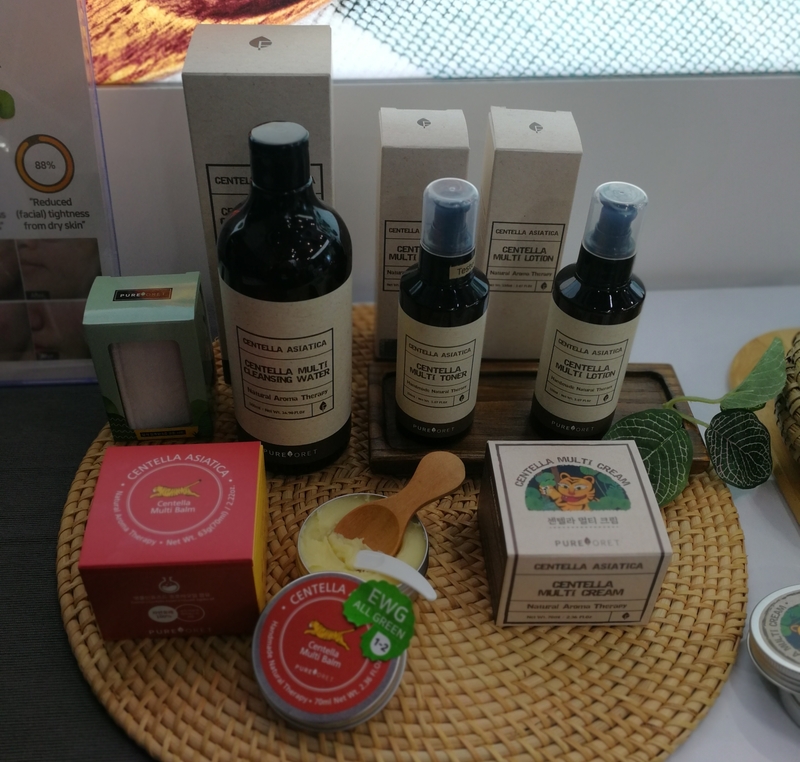 I first met Korean natural beauty brand Commleaf at Cosmobeauty Seoul 2017 trade show and immediately liked the young company’s skin care products. 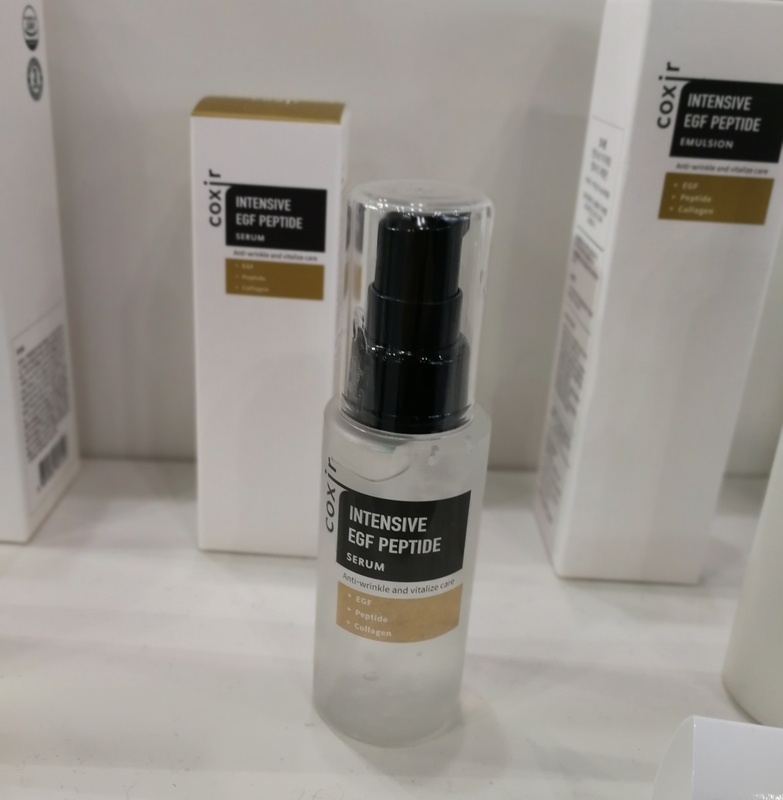 At this year’s Cosmobeauty (check out my trade show review here) Commleaf presented two new AHA-based Peeling Liquids – Green Tea and Honey Propolis. 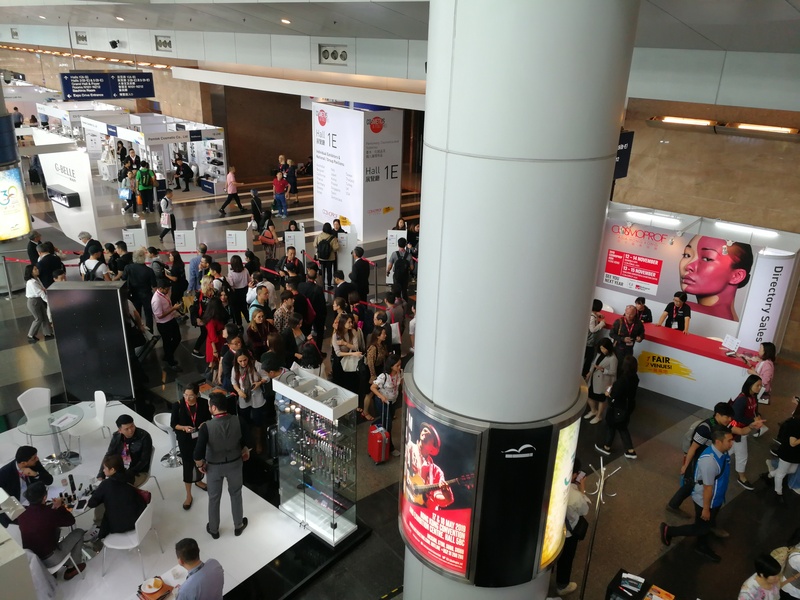 Unfortunately the Honey liquid was was sold out then, so it was rather providential that Commleaf also attended Cosmoprof Asia 2018! ; ) – I bought a bottle a trade show prices and look forward to trying it out properly soon. Anyway, Commleaf also presented two entirely new product ranges, the Leaf range (green) and the Rice range (pink). Isn’t the packaging beautiful? Fluid and clean and evocative of fresh, sparkling water and crystal facets and the bottles feel wonderful when you hold them in your hands. The Leaf range comprises four products – a soothing toner, a fresh serum, moisture cream and cleansing oil – while the Rice range offers an essence water, a glow serum, moisture cream, foaming cleanser and toning cream. 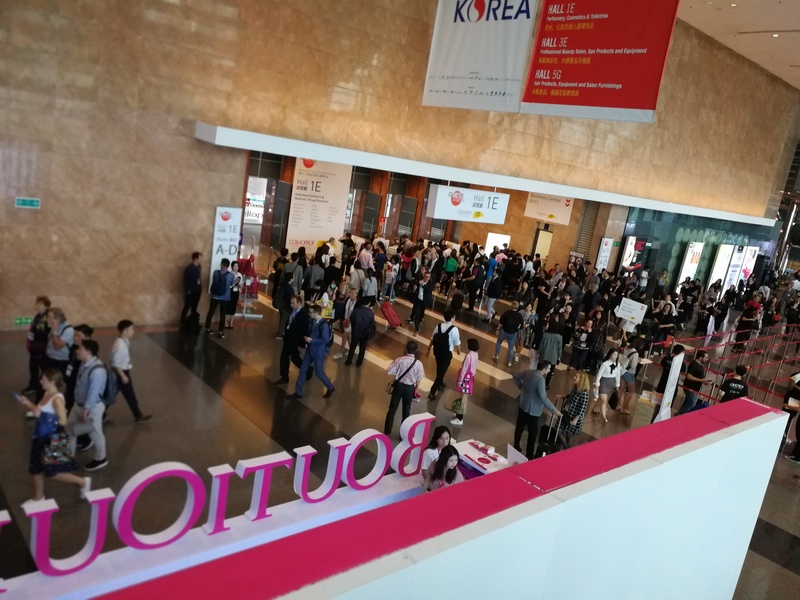 K-beauty brand Pure Foret was launched in 2002 and they are a returning exhibitor at Cosmoprof Asia. 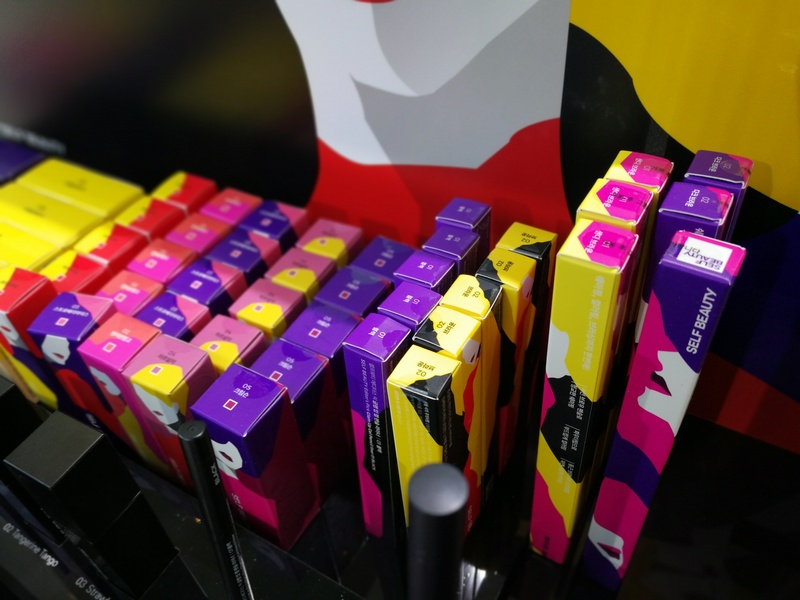 I had come across the brand name – or at least seen them at various trade shows – but I had never actually looked at the products in more detail. 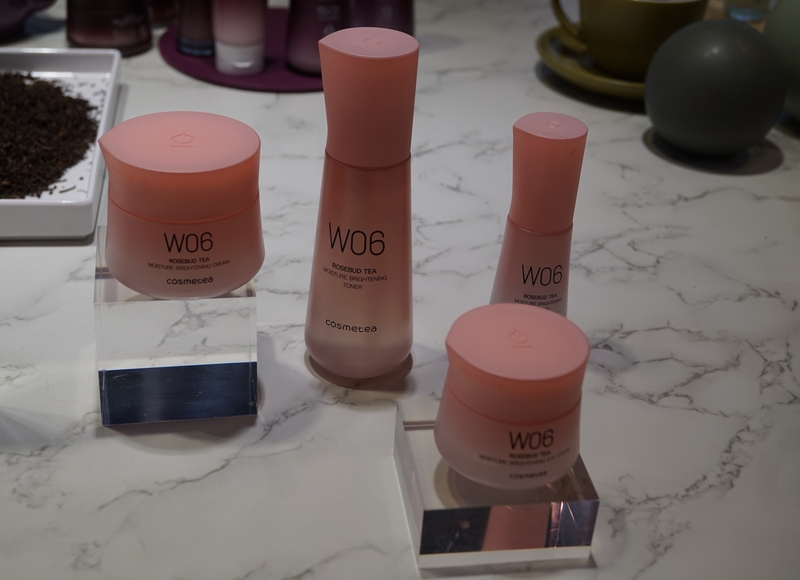 Their newest launch is the 5-sku Centella range of face and body care which was introduced in June 2018. All products all contain centella asiatica (tigergrass, also known as cica) and the product formulations are pretty natural. The red-packaged Multi Balm is based on centella asiatica macerated in jojoba oil and has a very pleasant scent; the ingredients could probably be certified. Another interesting beauty discovery was organic beauty brand Little Tree, also from Korea. The brand (and its 3-sku product range) was only launched last month which is (presumably) one of the reasons why it is almost impossible to find information about the company that’s behind the products. Anyway, the range comprises a sheet mask, a rose-scented gel moisturiser and a rose water spray. 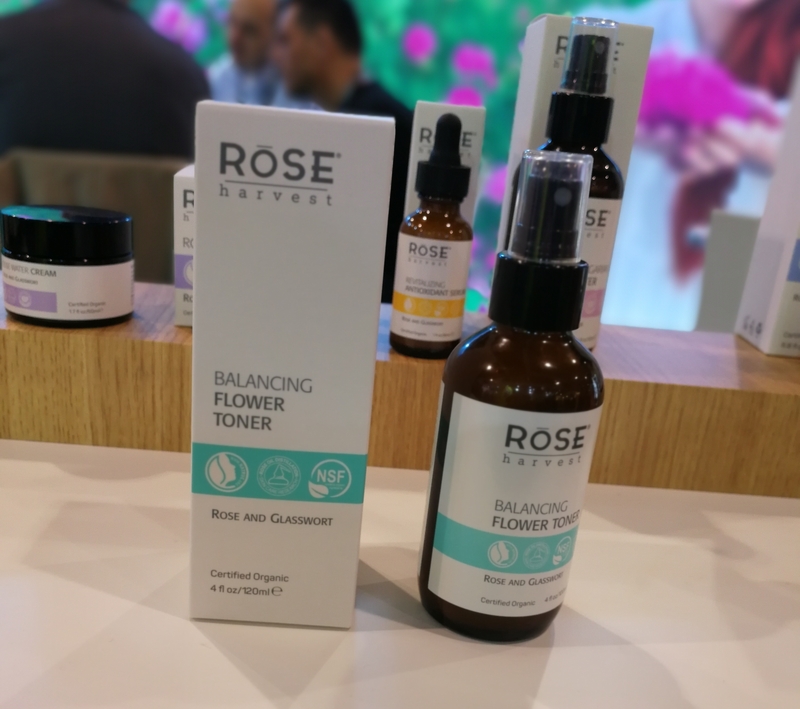 All products are based on organic rose water from Bulgaria – that’s where the 96% comes from, it’s the percentage of rose water – and the other ingredients are very close to being organic, especially the Facial Healing Gel. 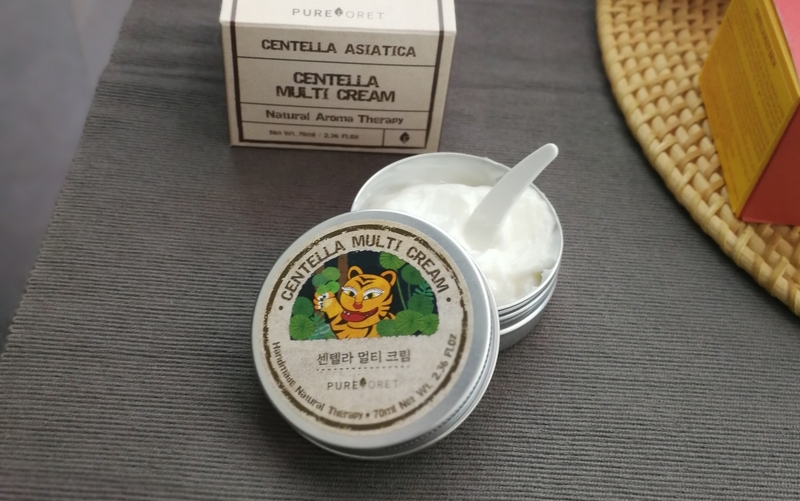 The nice lady at the exhibition booth translated the ingredients on the pack for me and they sounded good, so I bought a jar of the moisturiser and a 10-pack of sheet masks. Pestle & Mortar, on the other hand, is a unisex skin care range from Ireland. The brand seemed so familiar to me and I couldn’t figure out where I’d seen it before. Turns out the products are sold in German online retailer Zalando’s new Zalando Beauty Store in Berlin! Which I had visited two months ago. Mystery solved. 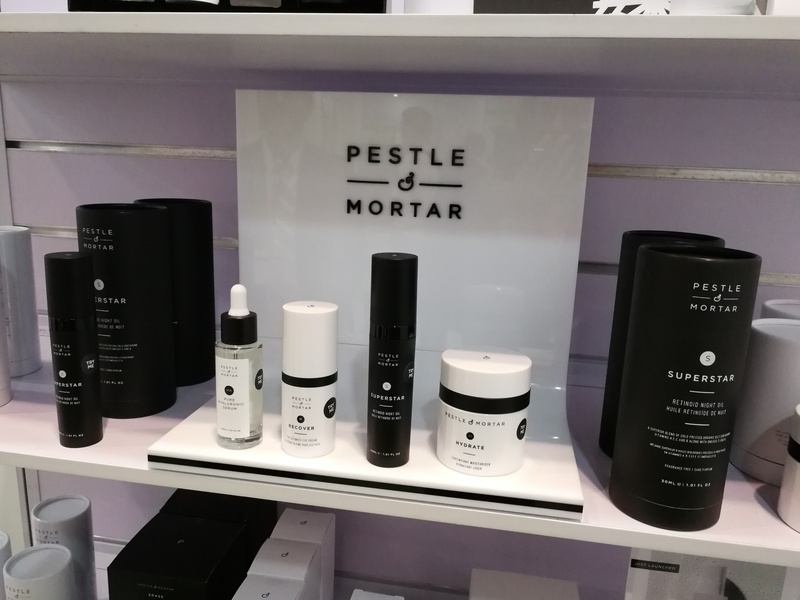 Pestle & Mortar, a first-time exhibitor at Cosmoprof Asia, was launched in 2014 and their product portfolio comprises seven products – a cleansing balm, gel cleanser, moisturising cream, hyaluronic acid serum (one of their bestseller), retinol night oil (a other star product), eye cream and toning spritz – which are sold in Denmark and Sweden, Spain, Germany and the US, Australia and Bermuda. I was also interested to find out that the company’s products are available in-flight on a number of airlines, including one of the big Gulf airlines (Emirates? Or maybe it was Etihad). Anyway, Pestle & Mortar seems to be doing well and now the brand also wants to explore the Asian markets. 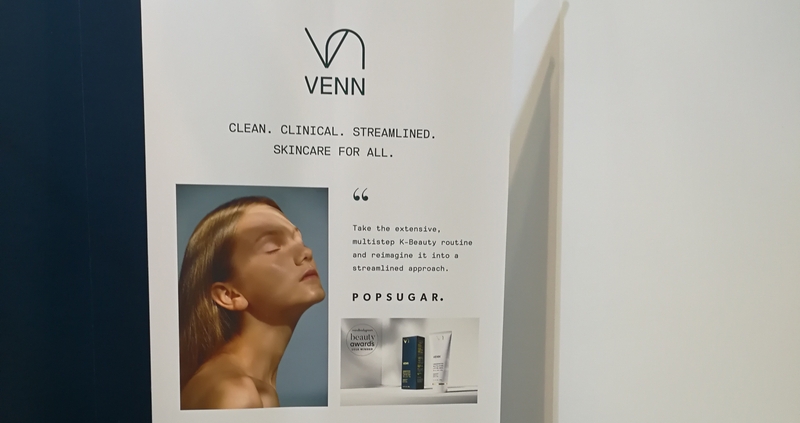 Venn Skincare was launched in November 2017 but they are already sold in the US (online) and South Korea (through the webstore of Korean retail group Shinsegae – I was told that the products will eventually also be available in Shinsegae’s offline locations) and the company is looking to expand into the European markets, too. Venn will launch in Italy soon and also in the UK. The product range is compact which reflects the brand philosophy: adapting the labour-intensive multi-step Korean-style skin care routine into just one or two clean beauty products, making it suitable for today’s busy urban lifestyle. 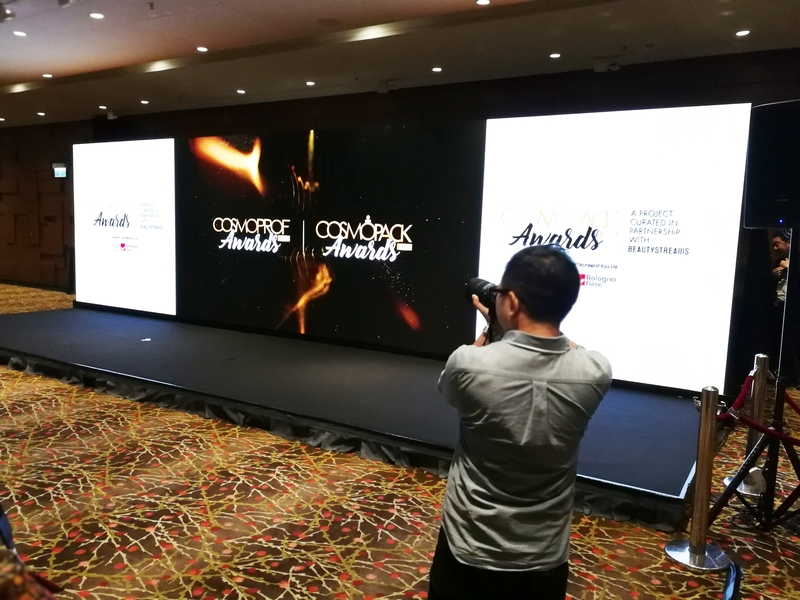 The keyword here is multi-use (which is, incidentally, one of the major trends identified by trend agency Beautystreams in this year’s Cosmoprof Asia Trend Report). 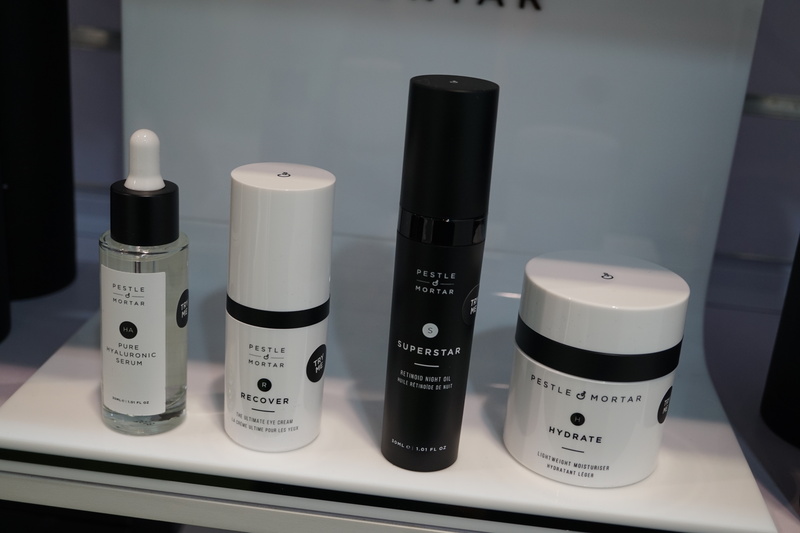 There will be three new products early next year (two of them are cleansers, I believe); and the company’s star product is the Age-Reversing All in One Concentrate. The product formula includes the company’s proprietary Concentric Technology – a blend of antioxidants and peptides – to deeply hydrate and firm the skin. The second product is the Concentrated Revitalizing Lifting Mask (see pic above) which, again, offers multiple product benefits in just one formula. 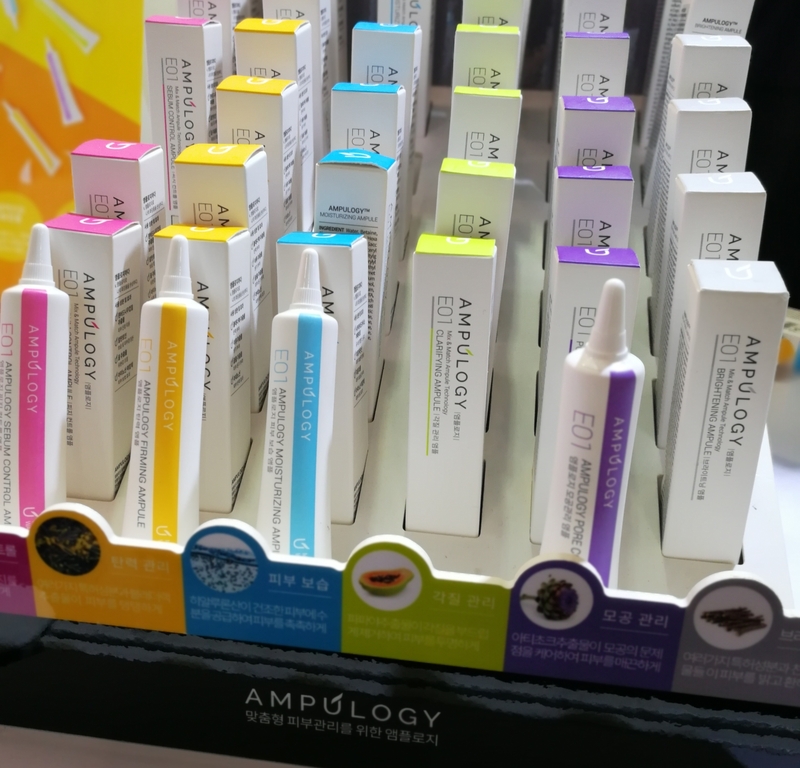 Ampulogy is an interesting Korean skin care brand which was launched in June 2017. As the brand name suggests, Ampulogy offers a range of clear liquidy gel serums to address various skin concerns – whitening, firming, sebum control, hydrating and so on – which can be added to your own skin care products to make them more effective. 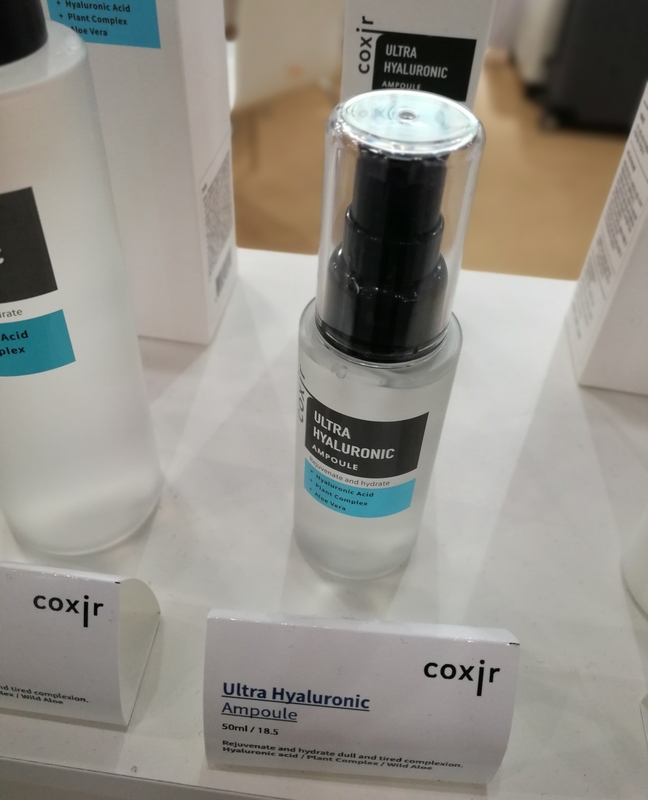 Skin care customisation was a major trend at Cosmoprof Asia this year; there were a number of Asian brands that offered this kind of ampoule/single ingredient serum concept. 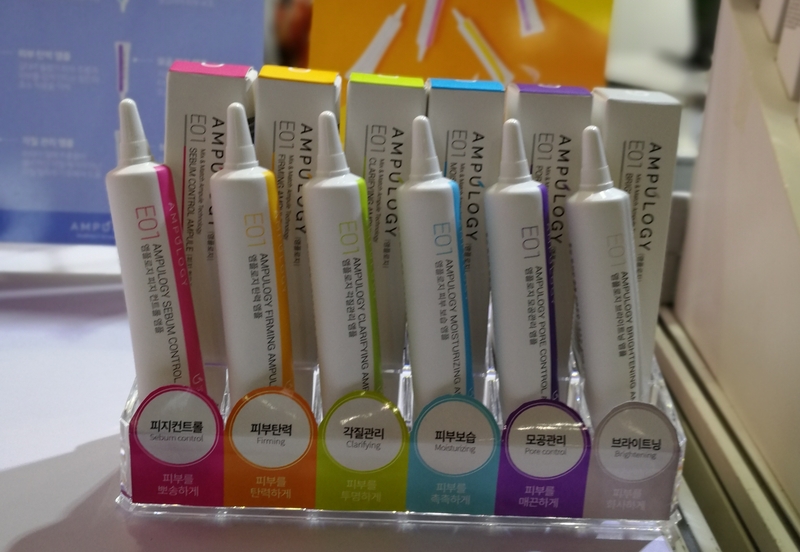 The Ampulogy product range was launched in May 2018 and offers s sebum control ampoule with salicylic acid (pink), a firming ampoule with beta-glucan (yellow), a clarifying ampoule (green) with papaya extract, a moisturising ampoule (blue) formulated with pentavitin extract, a pore control ampoule (lilac) with thistle extract and brightening (grey) with Alpine plants and peppermint extract. There is also a much more concentrated serum range especially for salon use. The six Ampulogy serums are beautifully packaged –I just love the colours of the product display! 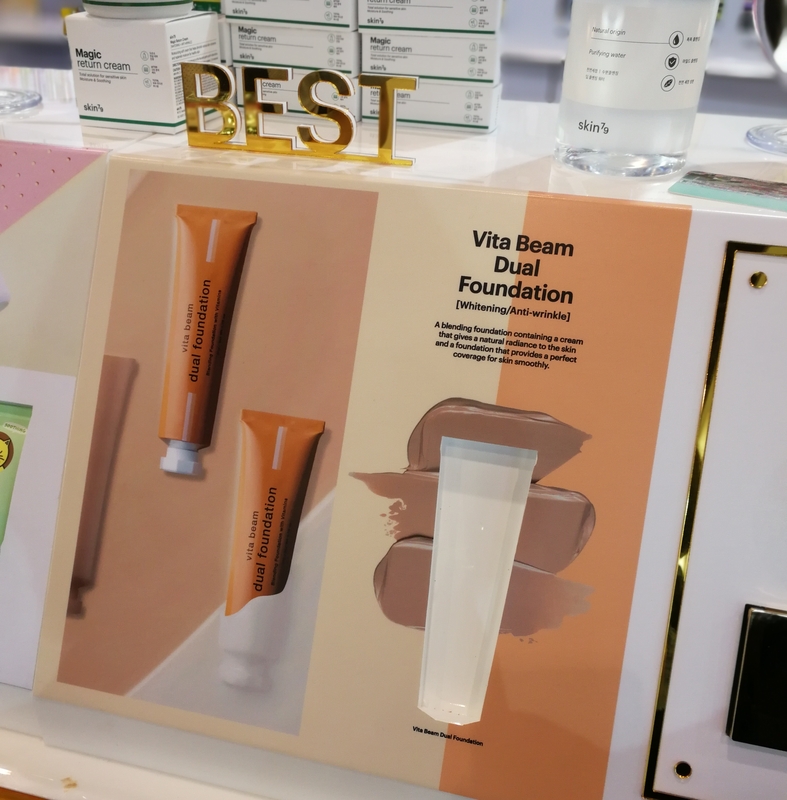 – and the products are available in Korea in a number of duty free malls, including Shinsegae Duty Free and Shilla Duty Free as well as various beauty salons. I was told that the brand is also sold in Russia and mainland China and at the moment the company is also in talks with distributors in the UK and France. 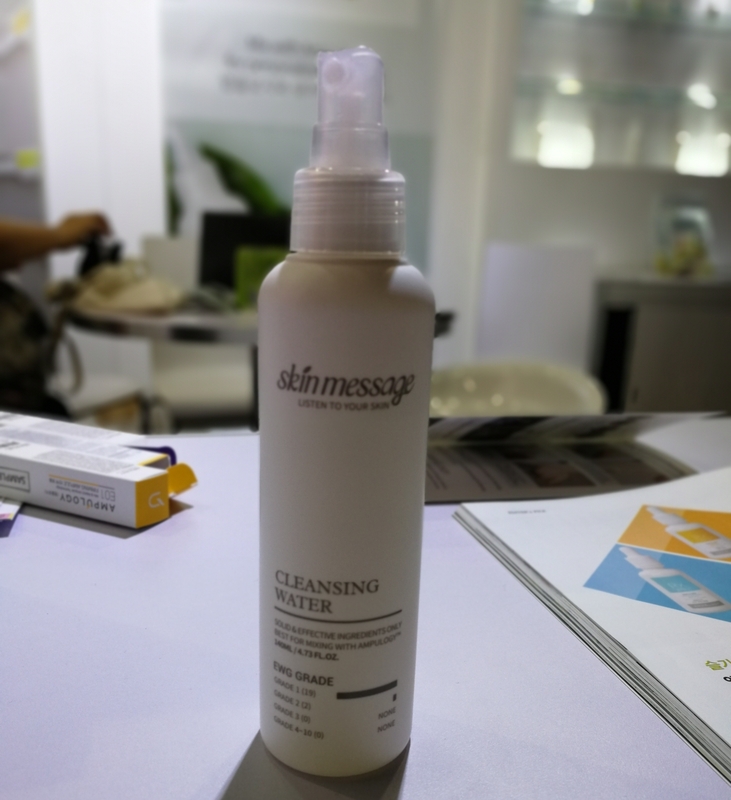 Ampulogy’s newest product is Skin Message, a cleansing water which was also launched this summer (see pic above). The Skin Message water can be customised and upgraded with the serums to boost its skin caring properties. The bottle has been designed to accommodate up to two ampoules worth of serum without the contents spilling over. Good product design! In fact, good brand concept. I really like this brand. 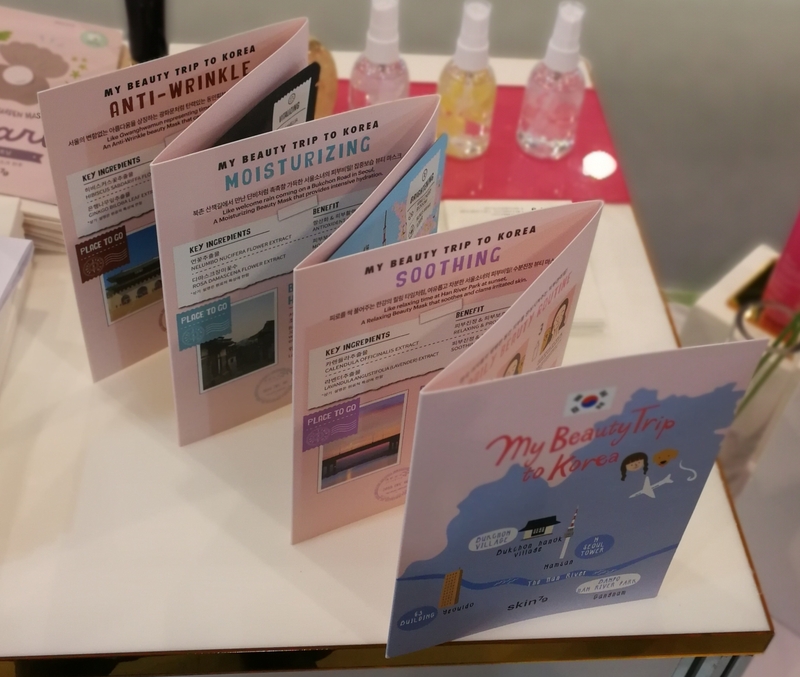 I first discovered Korean beauty brand Cosmetea at last year’s Cosmoprof Asia trade show – if I remember correctly, it was their first trade show appearance. The brand’s products are based on tea water and tea extract – hence the brand name – with pretty packaging and an all-round solid brand concept. 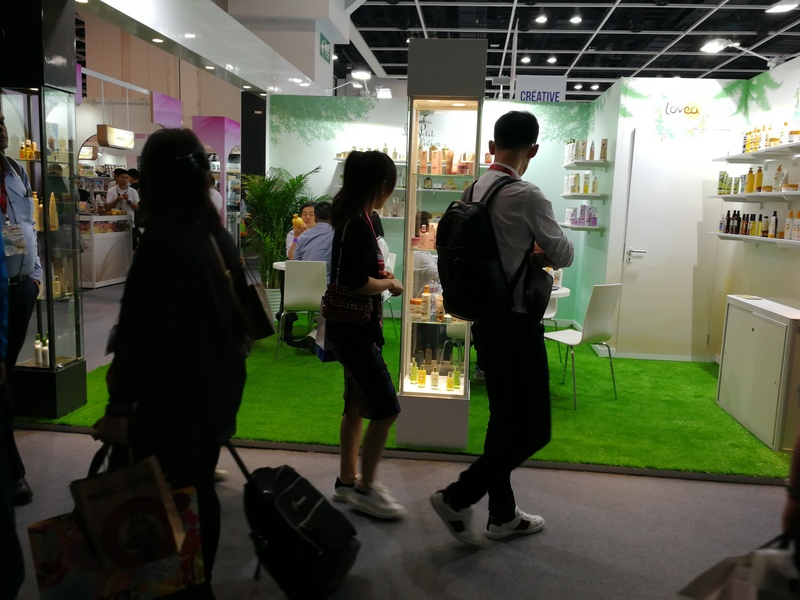 This year Cosmetea returned to Cosmoprof Hong Kong with a shedload of new products – seriously, their booth was about three times the size of last year’s exihibition stand! 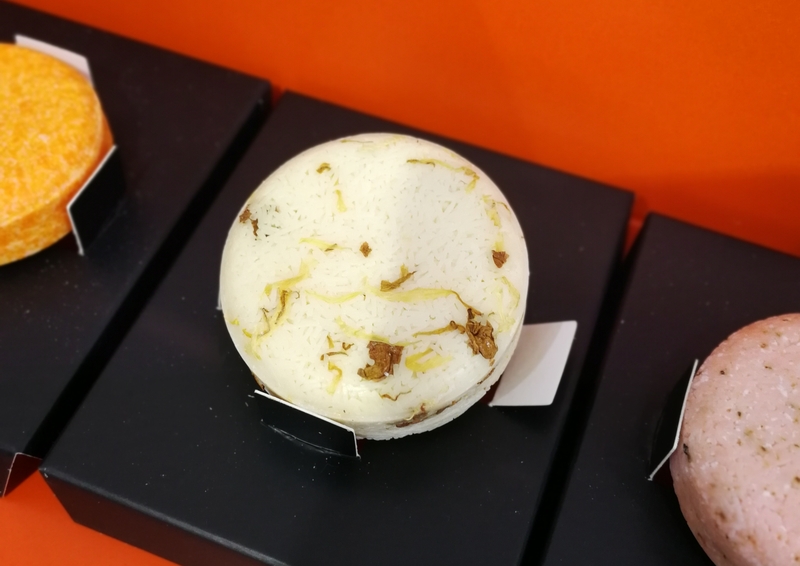 The new tea care ranges which you can see in the pictures below were launched on the occasion of the trade show: there are some 35 sku across seven product ranges. Each range is based on a different type of tea with products fornulated for specific skin care concerns: Camomile Tea (yellow packaging) to soothe skin, Mint Tea (turquoise pack design; see first pic!) to help tighten pores, Rosebud Tea (pink, middle picture) to brighten skin, Green Tea (green packaging) to refresh and hydrate, Puer Tea (purple, Pic 3) for intensive moisturisation, Black Tea (dark red packaging) to increase radiance and White Tea to tone and firm the skin. Ah, Kocostar. Surely one of the first K-beauty brands to make sheet masking an instagrammable experience! Kocostar’s iconic fruit slice masks – I remember how impressed I was when I first saw the slices at K-Beauty Expo in November 2015 – are now available in drugstores and online stores across Europe (including Germany where the fruit slice masks are sold in DM drugstores and through online perfumery http://www.douglas.de). Over the last years Kocostar has launched some spectacular sheet mask designs and this year I think they’ve outdone themselves. 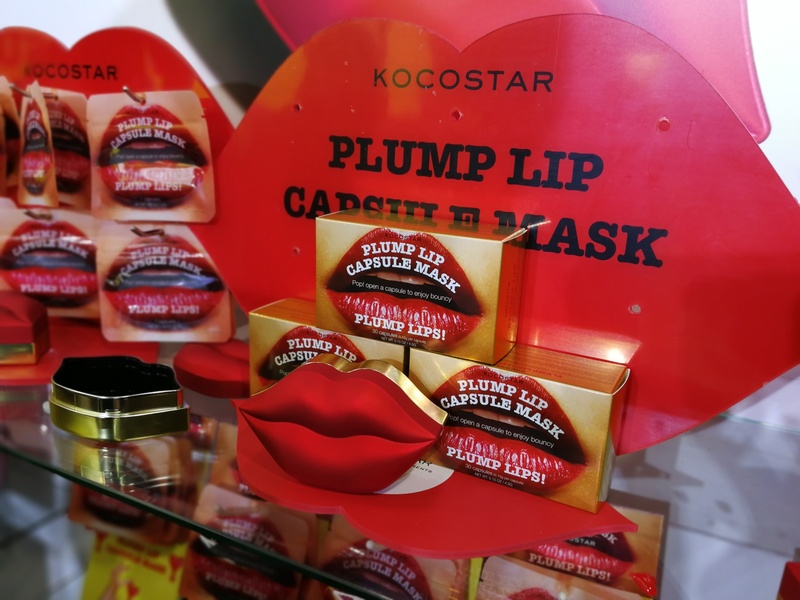 Check out the pics above: Kocostar’s focus this year is the lip area and the brand has introduced a range of lip masks – including serum masks which are packaged in heart-shaped twist-off ampoules (that in turn are housed in lip-shaped tins) and hydrogel lip sheet masks which make your mouth look like you’ve slapped on a Snapchat filter (or like you’ve had a bad allergic reaction or too many filler injections; take your pick!). 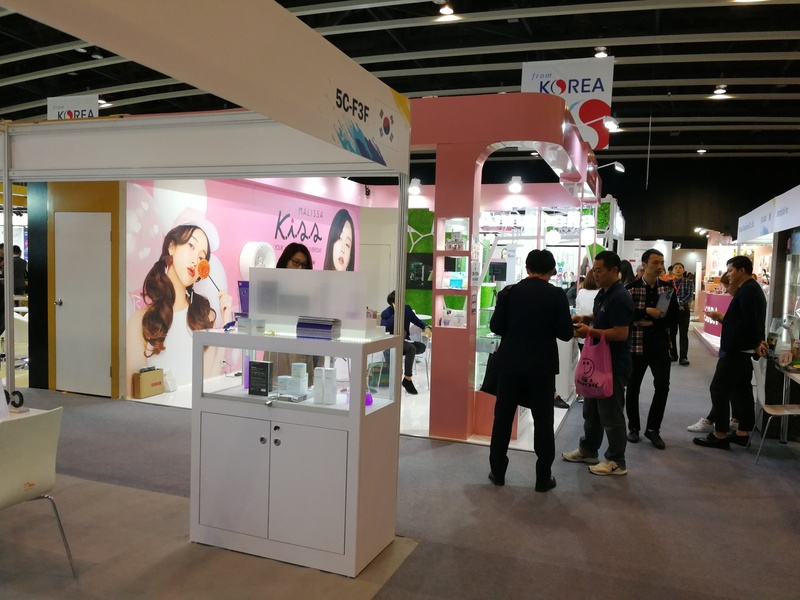 All of these masks are so selfie-worthy and Kocostar’s exhibition booth at Cosmoprof Asia was packed with visitors. I’m Sorry for My Skin is one of Korean manufacturer’s Im1ne best-known face mask range. 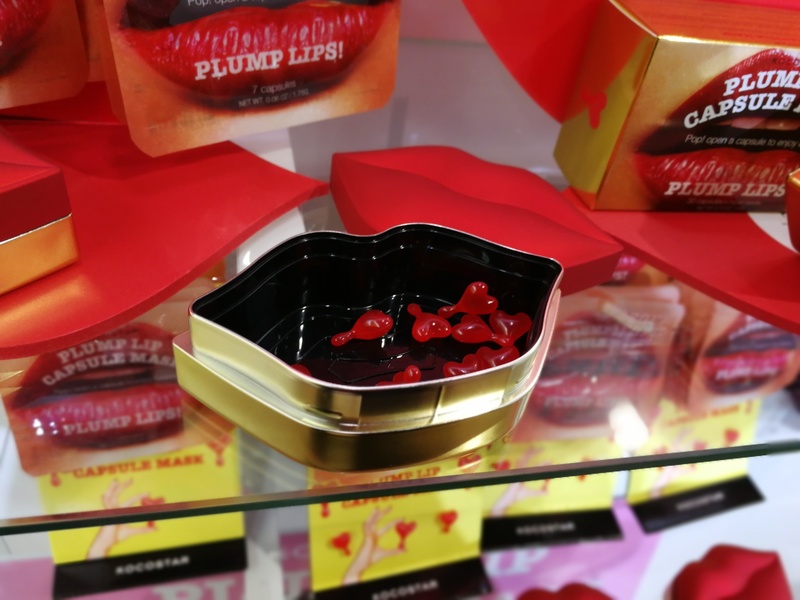 Their initial launch was a line of sheet masks packaged in a truly eye-catching design: like cigarette smoke curling up slowly from a cigarette, a half-emptied beer glass or a large AM/PM sign indicating a party that has lasted all night (i.e. not enough sleep) – always with the I’m Sorry For My Skin logo plastered across the mask pack. The original sheet mask range has since been extended several times; each year the company introduces more skin care products under the I’m Sorry For My Skin brand. This year the new launches included two ampoules (see first pic) and an 8-step skin care routine travel set; all under the same brand name. 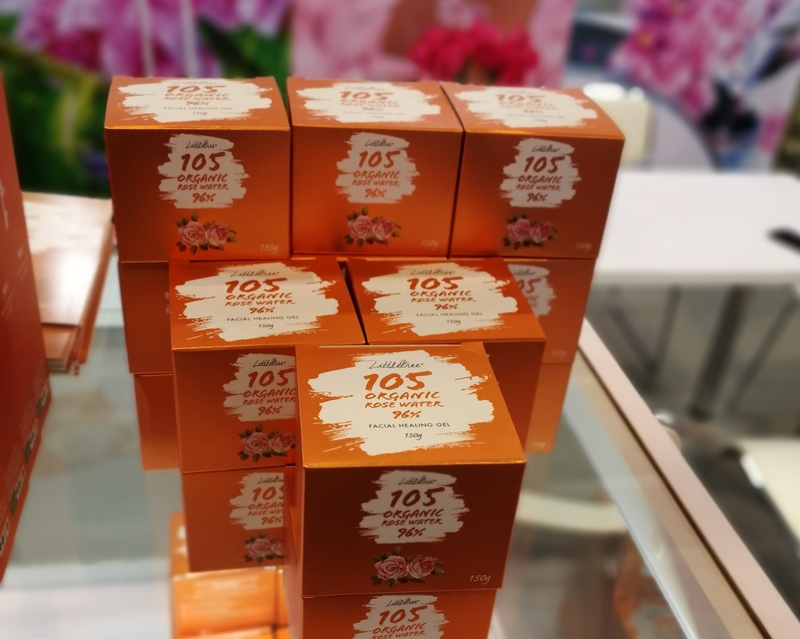 Every year at Cosmoprof Asia, Taiwanese luxury face mask brand Maskingdom presents a host of innovative new skin care products. 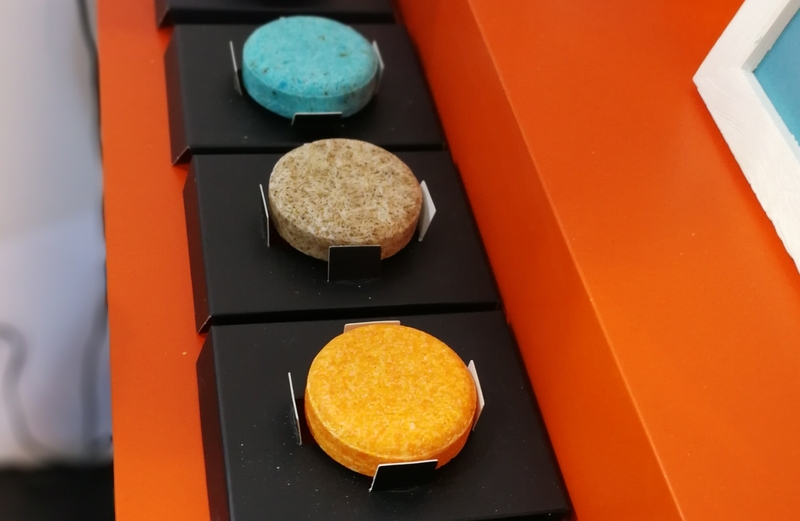 Last year it was the fabulous Cleansing Flakes, this year the brand introduced a range of skin cleansing bars – the final outer packaging wasn’t ready in time for the show so my picture show the soaps only. There are half a dozen different variants and most of these appear to have a different soap base – in some of the bars the soap granules were rice corn-shaped, in others they looked more round. I tried one of the cleansing bars under running water and as you might expect from a Maskingdom products (the company excels at good product formulations), the soap foamed up almost immediately and left the skin very smooth indeed. 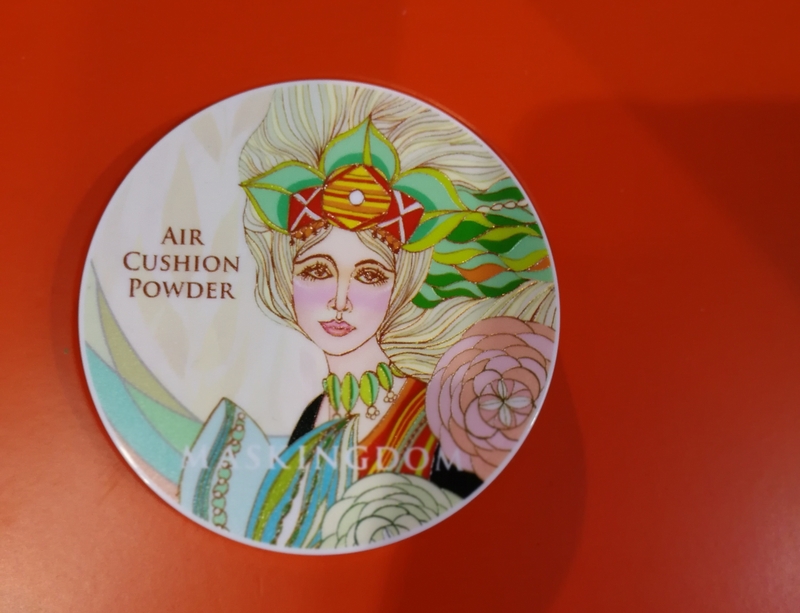 The second exciting launch is a range of Cushion Compacts (see pics above) which are, of course, decorated with Maskingdom’s iconic Aboriginal art designs. 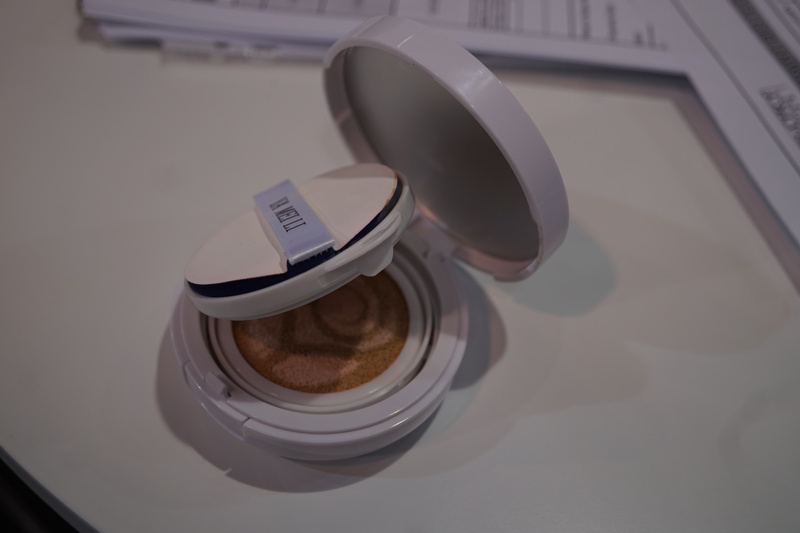 As cou can see in the photo the cushion contains two different colours (or formulas, rather) and the ingredients are almost organic. I came across organic Taiwanese beauty brand Inna Organic on Instagram this October, just before I left for Asia. The products looked very interesting (and they’re certified organic!) so I contacted the brand on Insta to find out about their stockists in Taipei. Amongst other locations, Inna Organic’s product range is sold in iGzen, a small shop-in-shop in domestic book store retailer Eslite‘s Xinyi store (Eslite is only my favourite Taiwanese retail chain EVER!!!). Long story short: when I got to Taipei I visited the Eslite, checked out the Inna products and bought one of the sheet masks. 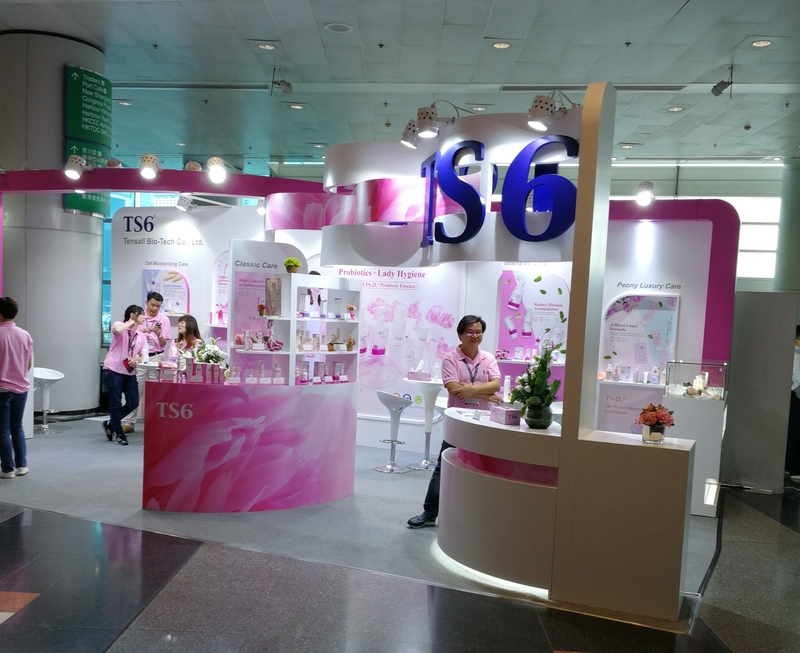 Liked it very much and was even more intrigued when I saw that the company was also exhibiting at Cosmoprof Asia. 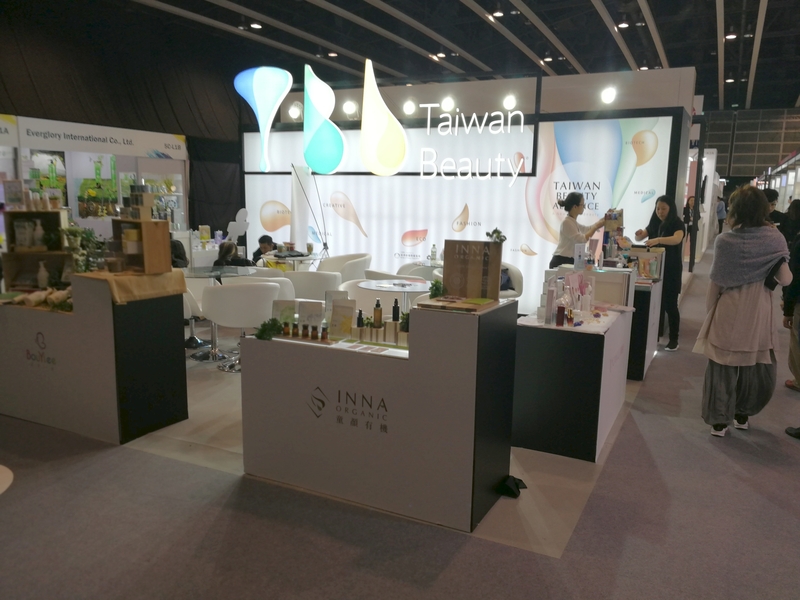 Inna Organic was launched in 2015; the company’s products are currently sold online (through Inna’s web shop) in several international markets, including mainland China, Hong Kong, Macao, Malaysia, Singapore and the US, with official distributors in Hong Kong, Vietnam and the US. Check out the pictures above for an overview of Inna Organic’s product line-up. And if you live in Germany and want to find out more about the company: Inna Organic will exhibit at Vivaness organic beauty trade show next February. I really like the pack design of UK face mask brand Oh K! K-beauty inspired sheet masks. I first met Oh K! at Cosmoprof Bologna 2017 (I think); at that time the brand was still fairly new – Oh K! was only launched in 2016 – but had already achieved an impressive online and offline distribution, not just in its domestic UK market but also internationally. And the product range has long since expanded beyond the classic sheet and hydrogel masks. Oh K! offers sheet masks for other body parts as well as cream masks and other skin care products. 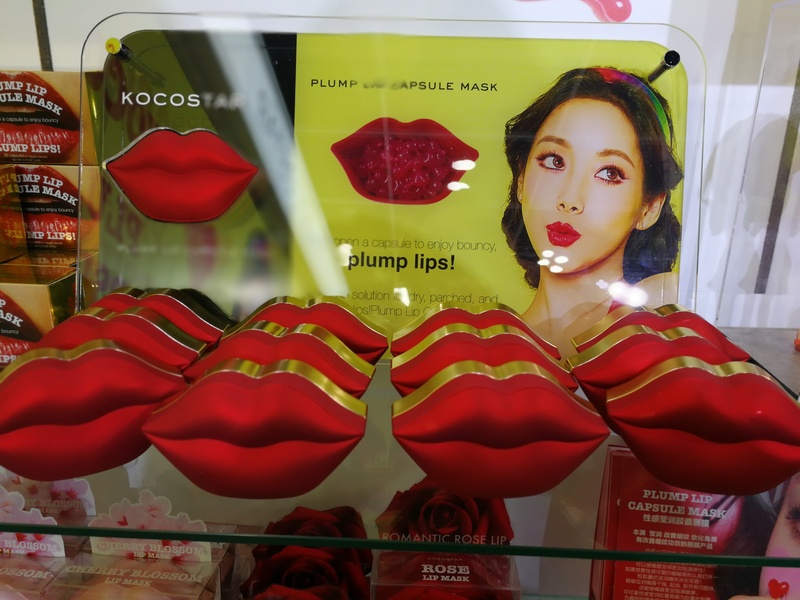 And although the brand belongs to UK-based beauty company Vivona, the masks are produced in Korea. 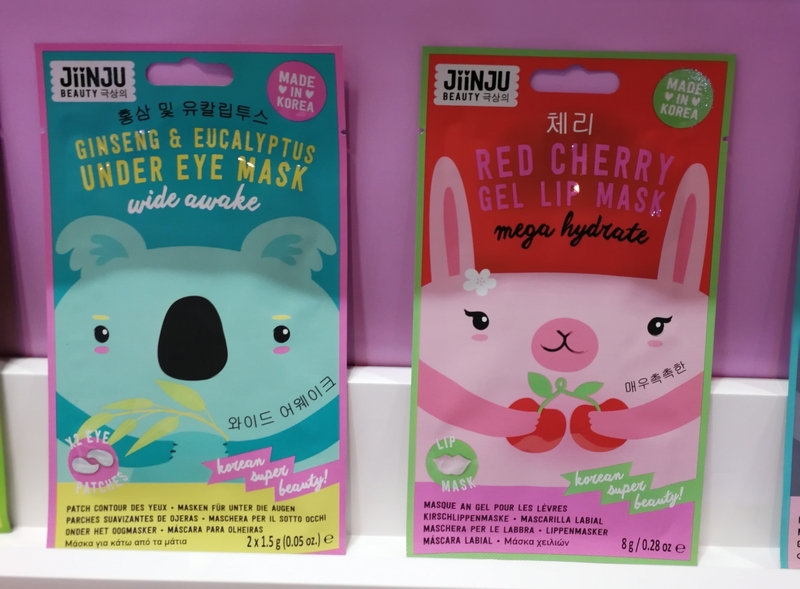 In addition to Oh K!, Vivona’s brand stable includes the Sugu range of face masks – Sugu has a younger demographic than Oh K!- and Jiin Ju (see pics directly below), a face mask range manufactured especially for Hong Kong-based beauty group AS Watson’s European store chains. AS Watson is the health & beauty division of HK retail conglomerate CK Hutchison (formerly Hutchison Whampoa). Amongst other business sectors, AS Watson operates the Watsons chain of drugstores. If you travel at all in South East Asia or East Asia you will have seen the bright turquoise Watsons store logo – the Watsons chain is the leader in practically every Asian drugstore market. 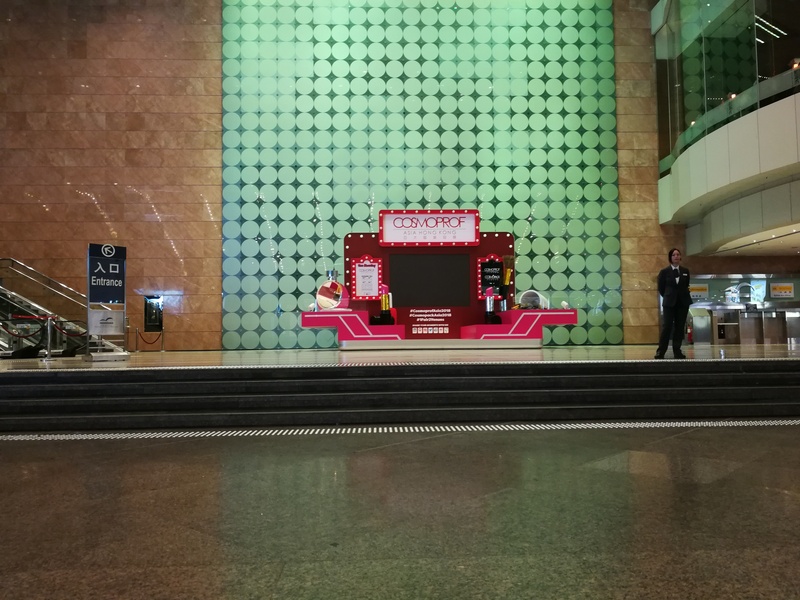 Ok, so AS Watson has this massive beauty retail business in Asia (the company also owns a number of other Watsons-branded retailers, like Watsons Wine or Watsons Bébé, as well as non-Watsons store chains such as electronics retailer Fortress) but – and here is where it gets interesting! – the company is also the biggest health & beauty retailer in Europe. Surprised? Don’t be. The AS Watson group has been quietly purchasing drugstore and perfumery chains in key European countries for almost 20 years now. The UK’s Superdrug, The Perfume Shop and Savers chains, for example, belong to AS Watson; as do Kruidvat and Trekpleister in the Benelux countries, Drogas in Latvia, Rossmann in Germany (yes! 40% of Rossmann shares belong to AS Watson. Since 2002. ), Marionnaud in France and Spektr in Russia. Several of these European beauty chains also have a retail presence outside of their domestic markets – like Rossmann which runs almost 1,700 stores outside of Germany – which means that AS Watson is a force to be reckoned with in the European beauty market. 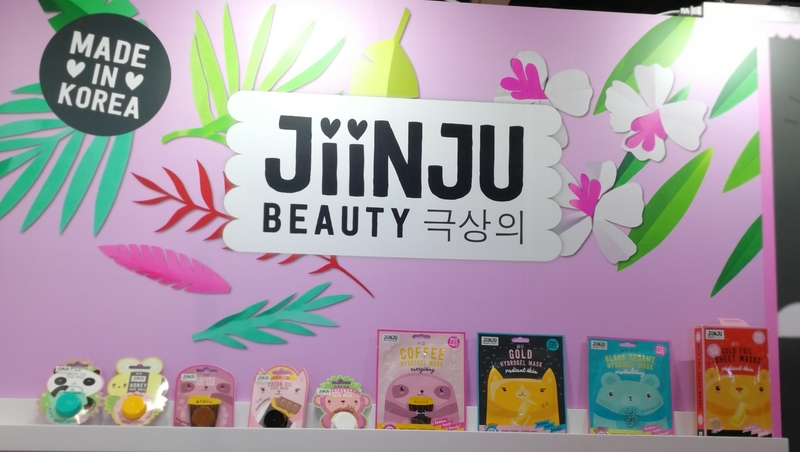 Anyway, the Jiin Ju range was produced especially for AS Watson’s European retailers and it has already been rolled out to Superdrug stores, I was told at the trade show. Presumably this means that Jiin Ju will also appear in the larger Rossmann stores at some point. But back to Oh K! and the other Vivona brand, Sugu. Oh K! is available in a number of international markets, including the US, Scandinavia, France, Italy, the UK (of course!) and Germany. Over here some of the Oh K! 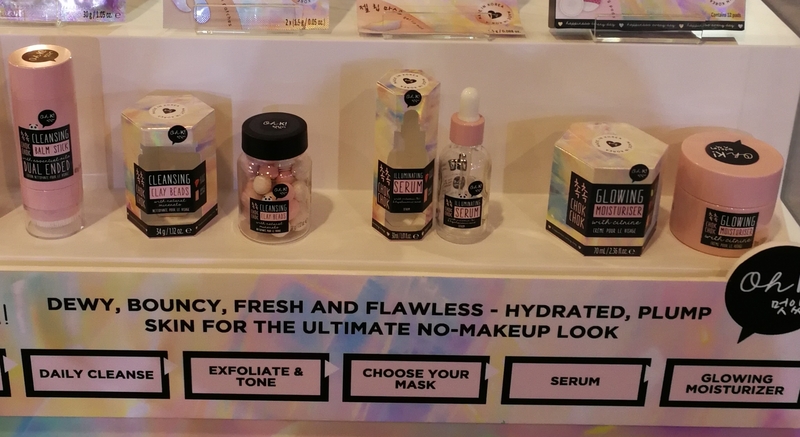 range are sold through fashion retailer H&M and in German perfumery market leader Douglas’ online store (Douglas has been adding a lot of K-beauty to its online brand line-up in recent years); I’ve also seen some of the sheet masks in Douglas stores here in Berlin. And Sugu masks are sold in German drugstore market leader DM’s stores as well as through the DM online store and various other online shops. 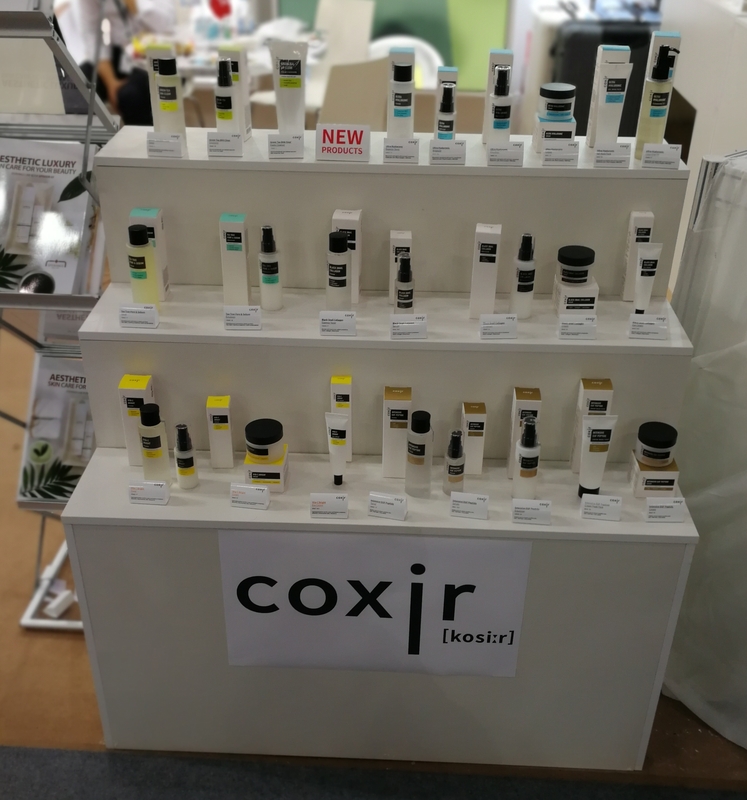 At Cosmoprof Asia 2018 Oh K! 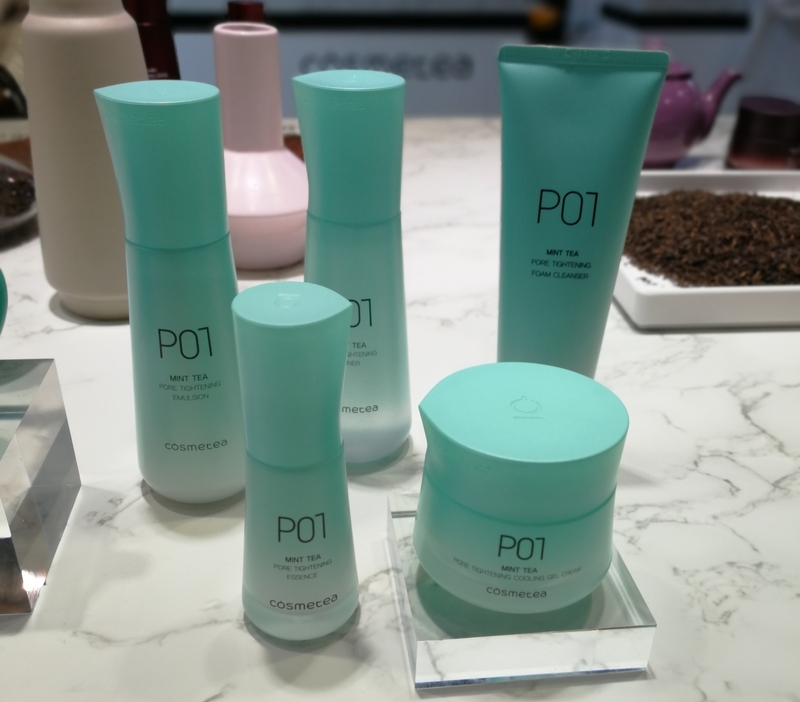 presented its new 11-sku product range Chok Chok (which means “glass skin” – i.e. hydrated, super smooth, clear skin – in Korean). See pics above! Isn’t the packaging beautiful? I love the opalescent colours and the jewel/crystalline visuals! 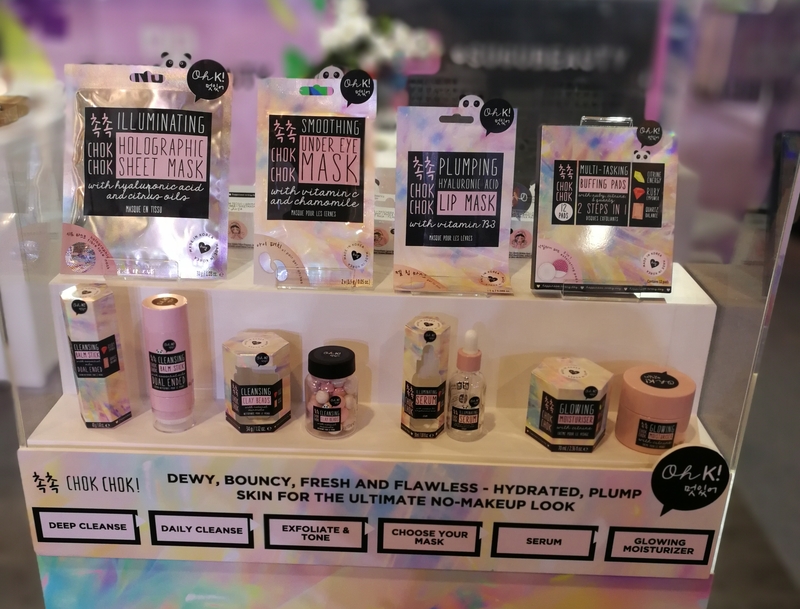 The line-up includes various sheet masks (for face, eyes and lips) as well as K-beauty inspired skin care – cleansing beads, for example; a face serum and moisturiser, a dual-ended cleansing balm stick and so on. This range will launch in early 2019, first in the US and then in Oh K!’s other international markets. I look forward to seeing it in-store! And now for something completely different! Casida is a young German pharmacy brand founded by pharmacist Alexander Helm back in 2016. The family-owned company started out with natural remedies for various skin care problems and they currently offer around 30 sku which are divided into several ranges. The line-up includes a 5-sku range of foot care products for fungal infections and a magnesium body care line for tired and stressed muscles while Repair & Protect comprises thyme-scented chest balms for cold symptoms and various oil blends to treat scars, mouth ulcers, irritated gums and hemorrhoids. 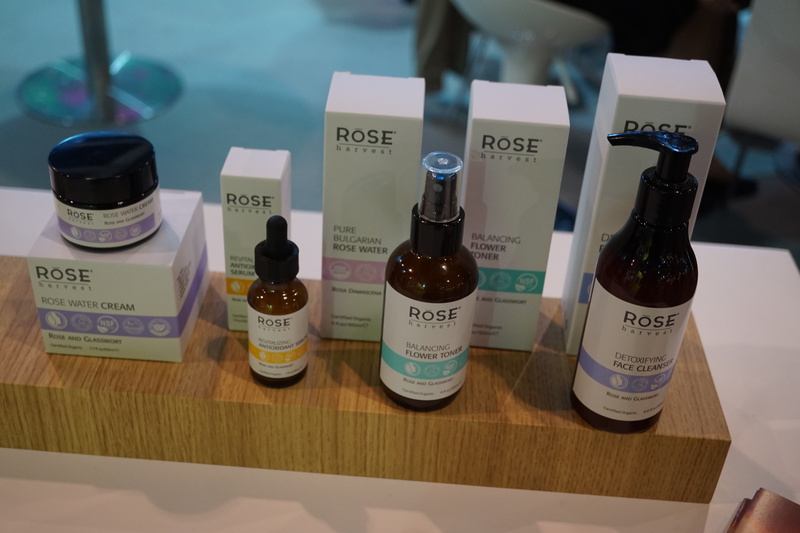 The brand’s most recent launch is a range of four natural beauty serums (see pic above): there’s a lash growth serum based on castor oil and thyme essential oil, a retinol serum, a hyaluronic acid serum formulated with two types of hyaluronic acid (low molecular weight and medium molecular weight) and a vitamin C serum which uses a stabilised vitamin C compound. The product formulas are all streamlined; Alexander told me that they tried to use a few ingredients as possible in order to make the products suitable for different skin types. 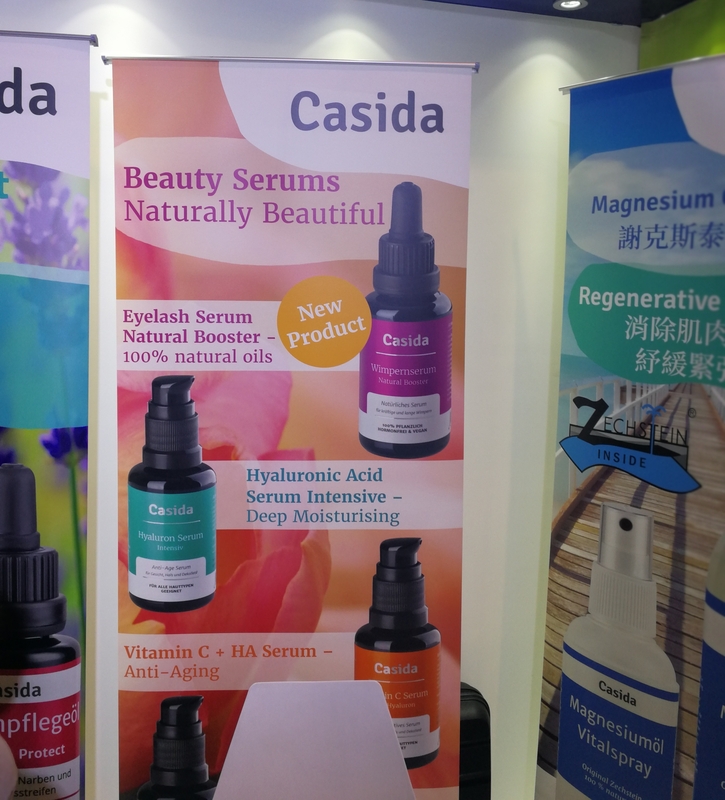 The beauty serums are priced at around 25 Euro and Casida’s product range is already sold in pharmacies across German, Austria and Switzerland. Now the company is setting its sights on the Asian markets. Hence their presence at Cosmopro Asia. And we’re back in the land of K-beauty! I knew Korean beauty brand Skin 79 by name and reputation (it’s a well-known face care brand with a solid international presence) but had never actually looked at their product portfolio more closely. Luckily for me the company was at Cosmoprof Asia, up in Hall 5! 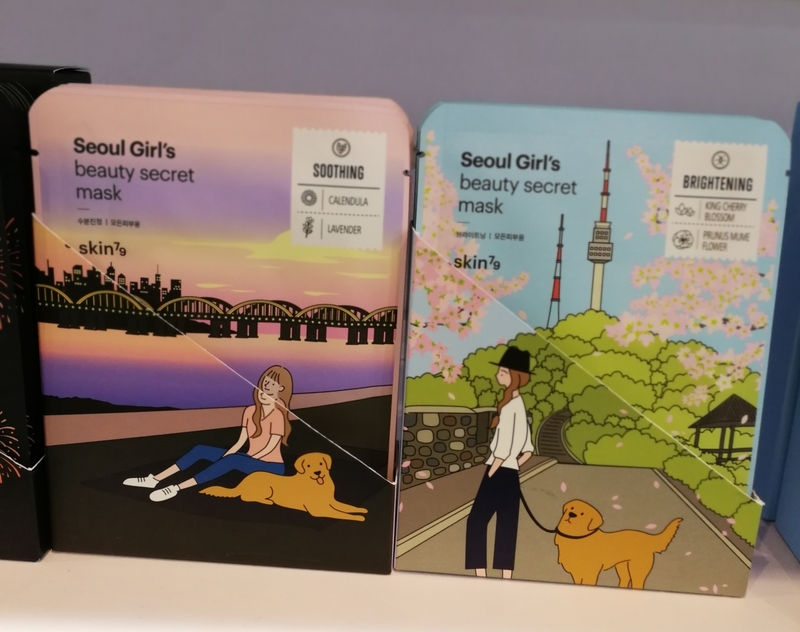 The first thing that drew my eye was the design of their Seoul Girl’s Beauty Secret masks – five beautifully packaged sheet masks whose packaging features different Seoul tourist attractions, always with the figure of a girl and her dog in the foreground. What a fabulous idea – using cosmetics packaging to tell a story or, in this case, promote the heritage and/or history of a brand. 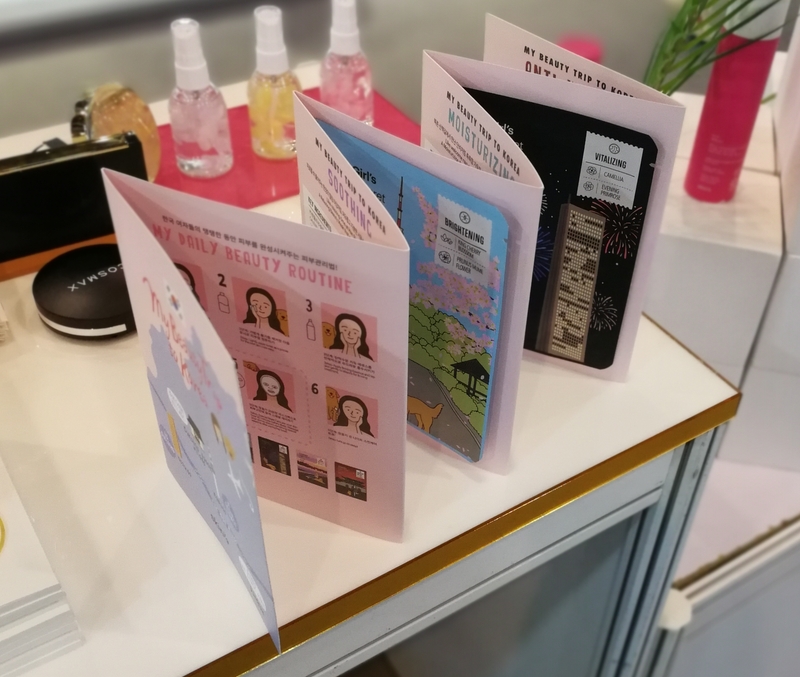 In the pic above you can see some of the sheet mask designs and in the pics below, Skin79’s recently launched Seoul Girl’s travel set which was manufactured especially for the brand’s market in Spain. 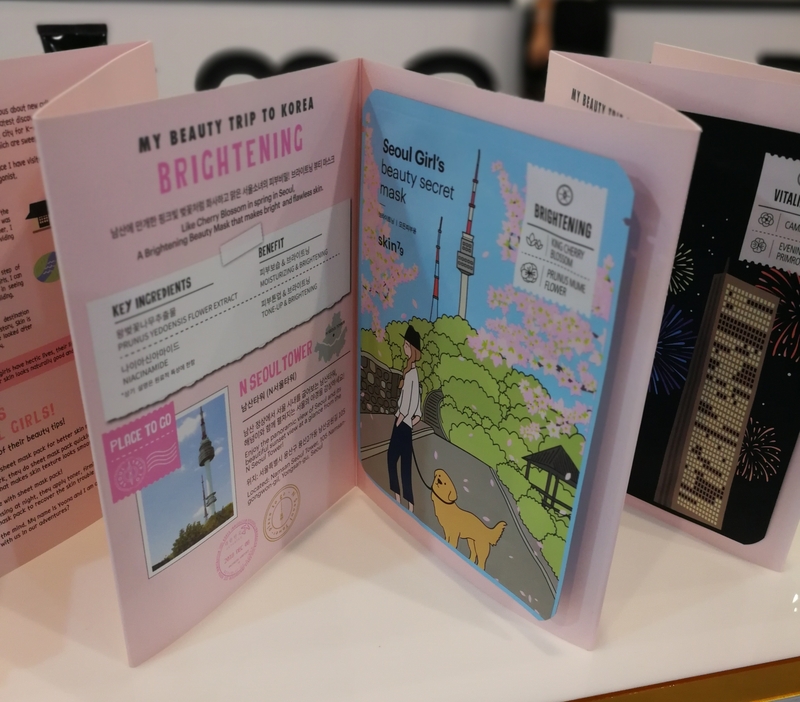 Entitled “My Beauty Trip to Korea” the travel pack is a fold-out mask set which is designed to look like a travel scrap-book. Each double page features a sheet mask and, on the opposite page, tourist tips and pictures. This is one of the most attractive and on-target travel beauty packaging designs that I have ever seen. 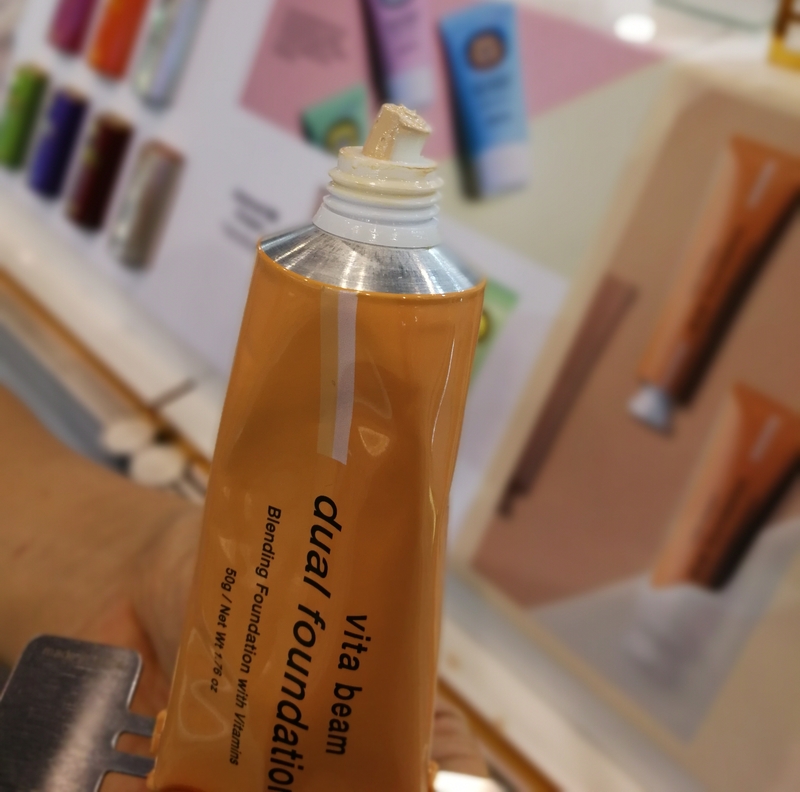 Skin79 also presented some other new launches, including the Vita Beam Dual Foundation which you can see in the pictures above: when you squeeze the aluminium tube the strand of cream that comes out is bi-coloured; half white (a brightening primer) and half beige (the foundation). 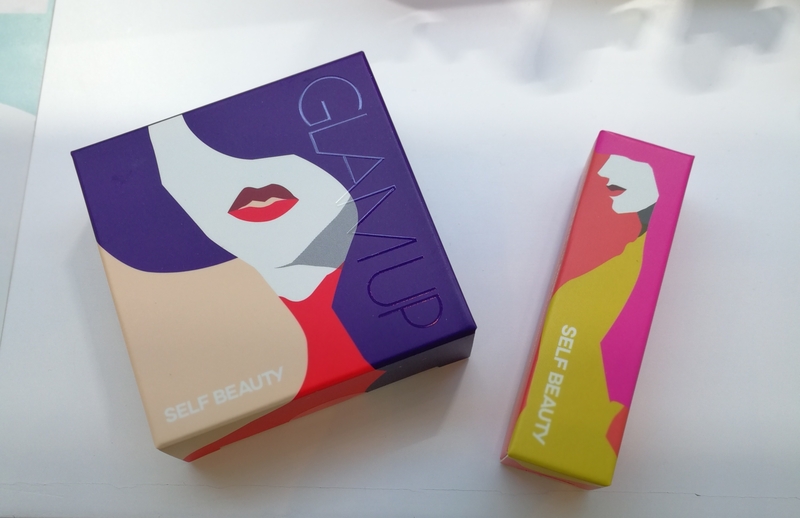 I think Self Beauty has the most striking looking makeup packaging that I’ve seen in a long time. 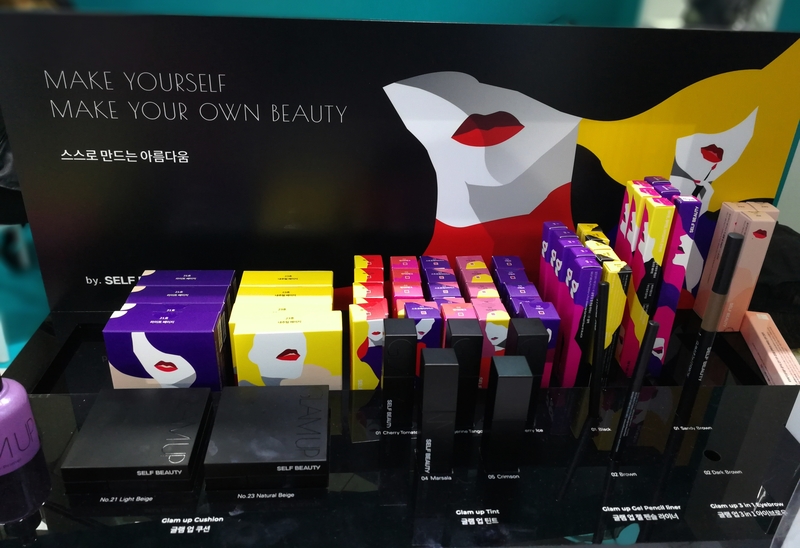 The makeup brand was launched just two months ago – I’m not entirely certain who the manufacturer is; Self Beauty was displayed at the booth of a large HK distributor whose portfolio also includes Dr. Jart+ – but, I was told, the brand is already available in LOHBs drugstores in Korea. Next time I’m in Seoul (which will be early May 2019 for Cosmobeauty, if you’re interested ; )) I’ll check this out. Anyway, the Self Beauty line-up comprises a primer, two cushion compacts, five lipsticks, a sun cream, two gel liners and two brow liners. And the packaging is gorgeously déco! 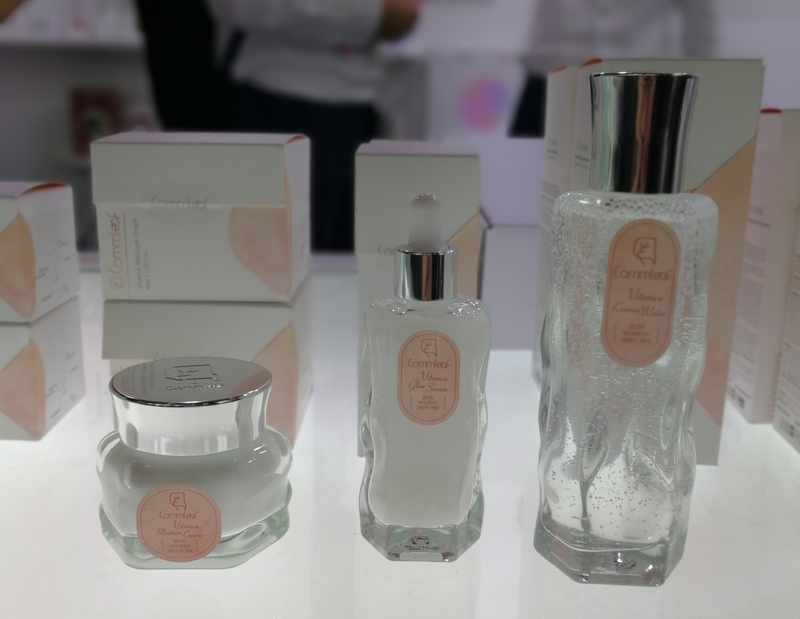 Dermo-cosmetic beauty brand Coxir is a recent launch by Korean C&T group Noksibcho (who also manufacture brands like The Skin House). Coxir’s portfolio comprises 25 sku which are divided into six ranges. The Green Tea BHA Clear Line offers a toner, emulsion and foam cleanser formulated with BHA, green tea extract and snail mucus. Tea Tree Pore & Sebum – a toner and an emulsion – contains tea tree, centella asiatica and volcanic water while the Intensive EDF Peptide range (a toner, emulsion, serum, cream and cream mask pack) has been formulated with peptides, collagen and EGF stem cells. 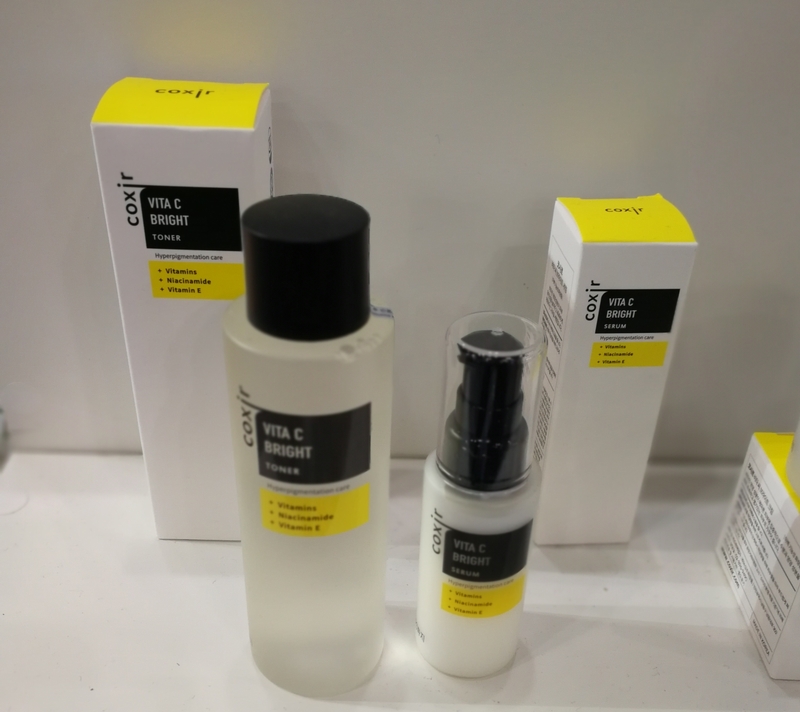 The Black Snail Collagen range comprises a toner, emulsion, serum, cream and eye cream formulated with snail mucus, collagen and adenosine while Ultra Hyaluronic offers a toner, emulsion, cream, ampoule, gel mask and cleansing oil and contains hyaluronic acid, plant complex and wild aloe. Finally, Vita C Bright features a toner, serum, cream and eye cream blended with vitamins, niacinamide and vitamin E.
The packaging design and overall look of this brand is rather COSRX-inspired (and the brand name’s not that dissimilar either…!) but it seems like Coxir has already found distributors for the Baltic countries, Poland, Spain and the UK. 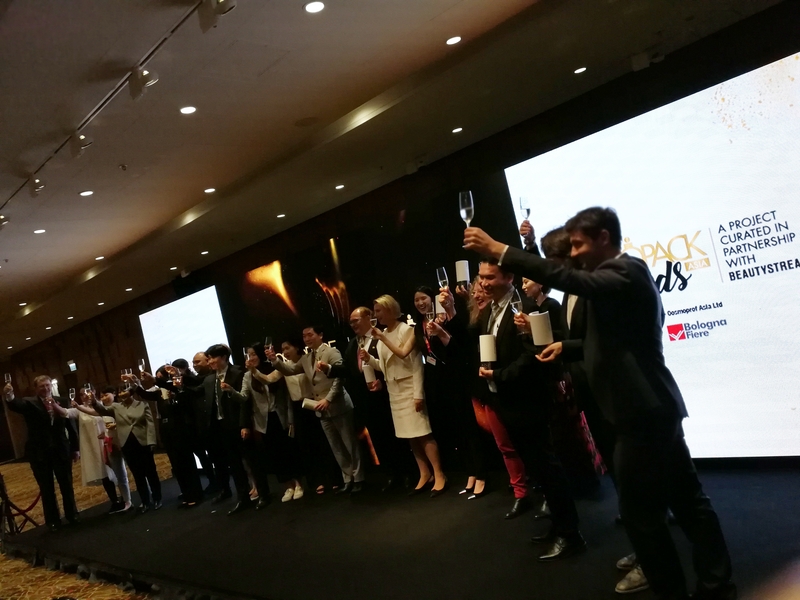 And the company has set its sights on further expanding across Europe – I was told that there is a very good chance that the product will be available in Sephora perfumeries in the near future. 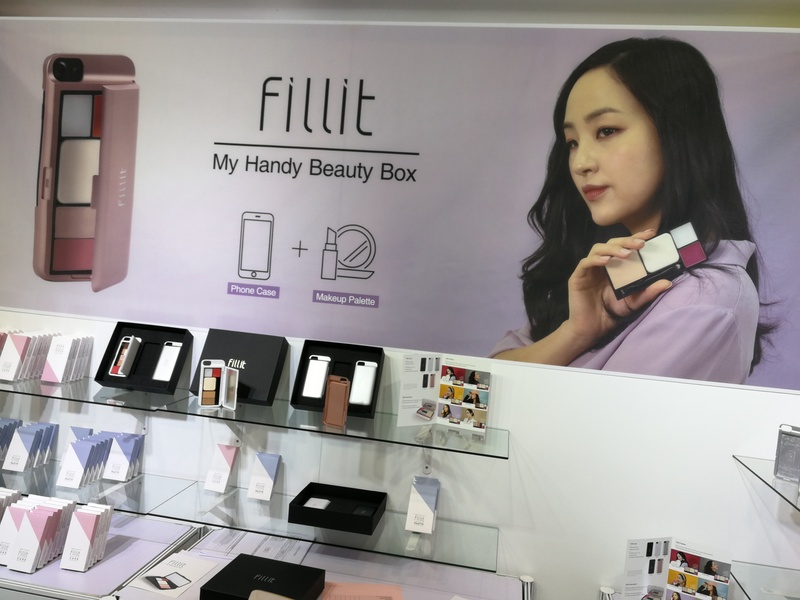 And now refresh your eyes with some truly innovative packaging design: check out the new launch from Korean start-up brand Fillit Beauty! 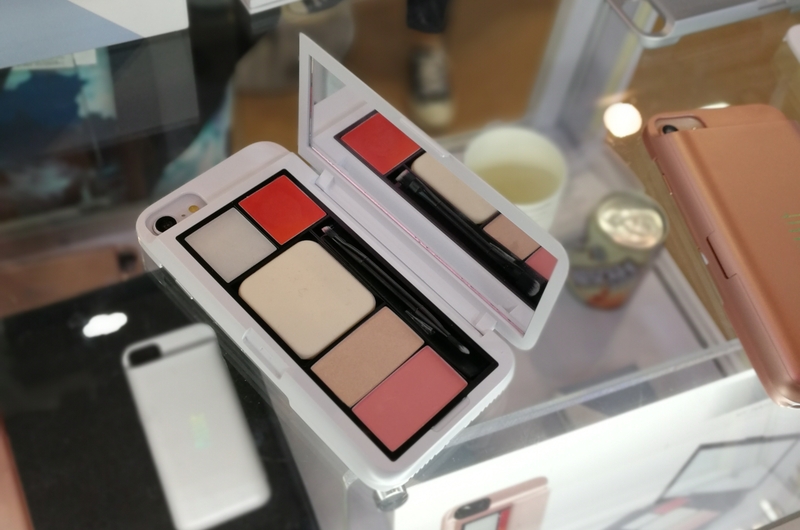 I had met Fillit Beauty at Beautyworld Japan 2017 and was very taken with their unique product idea: slim refillable makeup palettes that are attached to smartphone covers. The palettes are not meant to replace your usual makeup but rather to complement it, allowing quick touch-ups while you’re out and about without having to take your makeup bag along. 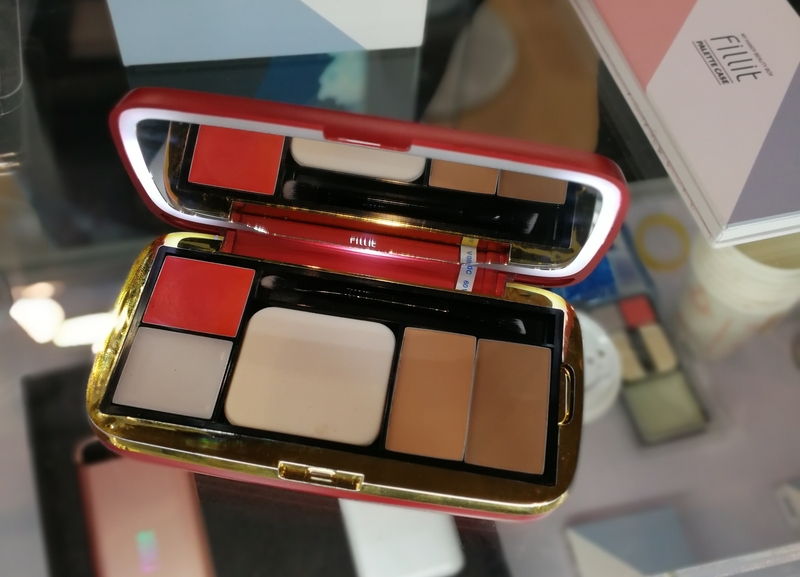 There are different palette configurations – eyeshadow + lip colour, face powder + lip colour, face powder + eyemakeup – in various colour combinations. At the moment the palette/covers are only available for iPhones but hopefully other phone models will be added at a later date. And Fillit is now available in Korea (online) and Japan (through Amazon) as well as in Canada and Vietnam. 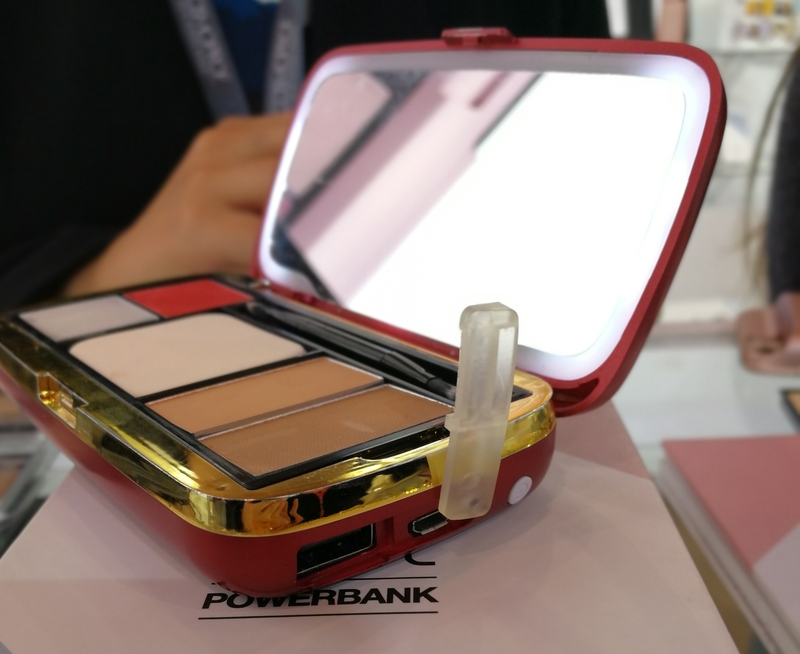 The brand’s newest launch is Fillit Powerbank (see pics above) which is exactly what it sounds like: a powerbank with a makeup palette attached to it! Or rather, with a slot that allows you to slip in the refill palettes – a perfect solution for people without an iPhone (like me; I’m a Huawei fangirl!) because you can still take the makeup along. And charge your phone (or tablet/mp3 player) at the same time. 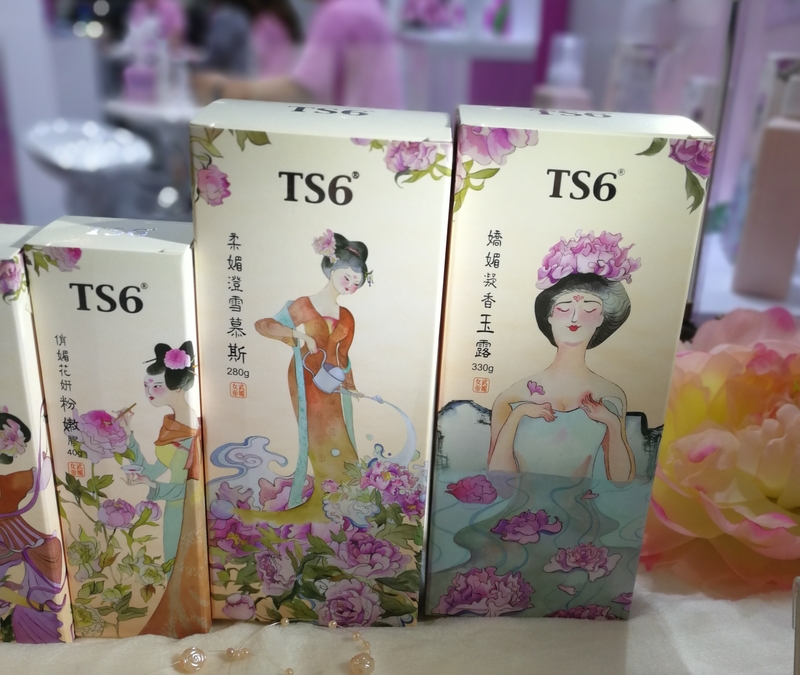 TS6 is a probiotic feminine hygiene brand from Taiwan. 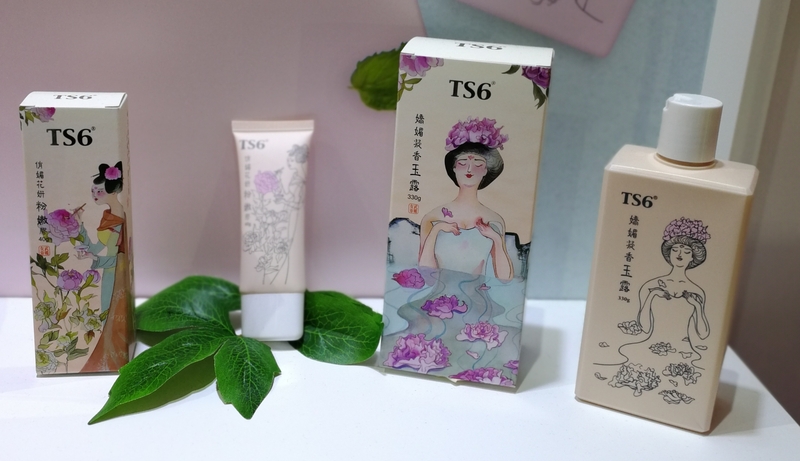 Manufacturer Tensall specialises in intimate hygiene product ranges formulated with fermented lactobacilli and one of of the Tensall ranges – check out the beautiful packaging in the pics below – was recently relaunched. I can’t read Chinese so at first I thought this was a TCM inspired bath and body care range or something. 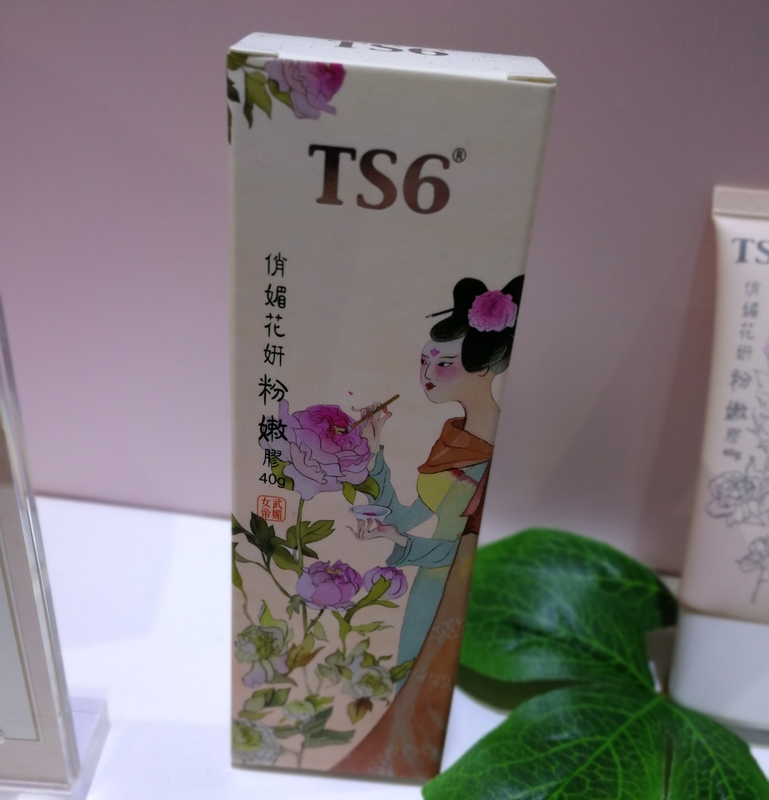 That’s actually not far from the truth; the product formulas of this TS6 line are very natural and packaged with herbal extracts. The range offers a cleansing foam, a bath essence, a skin-firming moisturiser and a whitening moisturiser and I really like the packaging design. 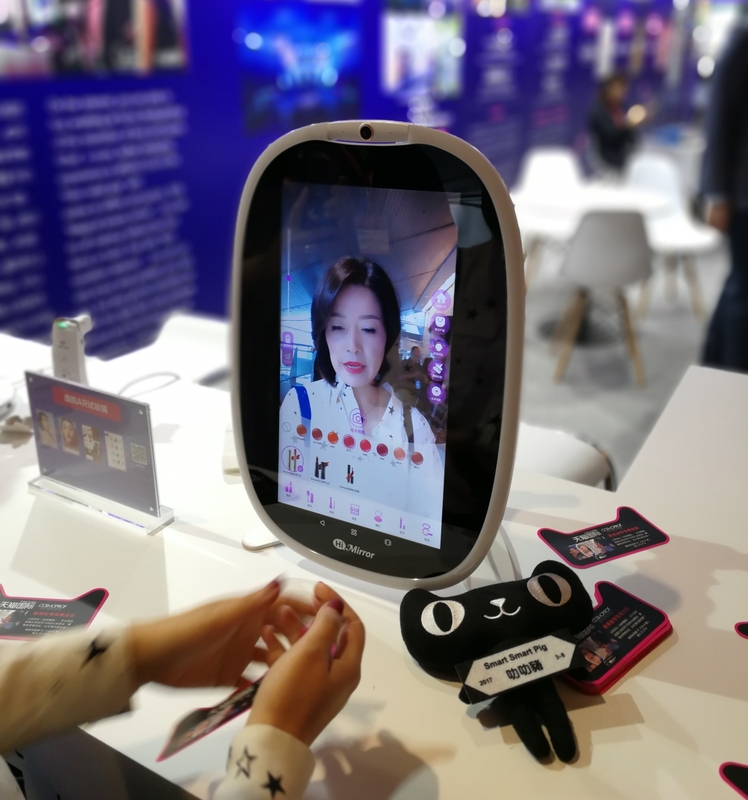 Chinese e-commerce retail group Alibaba‘s Tmall subsidiary was also at the trade show with a new beauty retail concept: a pop-up store featuring Augmented Reality mirrors. Tmall is Alibaba’s cross-border e-commerce site – through Tmall, non-Chinese fashion, beauty and consumer goods brands and retailers can sell directly to Chinese consumers without having to go through an official product registration in mainland China. The Chinese cross-border sector is a fascinating market and Tmall is one of the biggest players – every year, more European and international beauty brands sell their product ranges through Tmall Global. 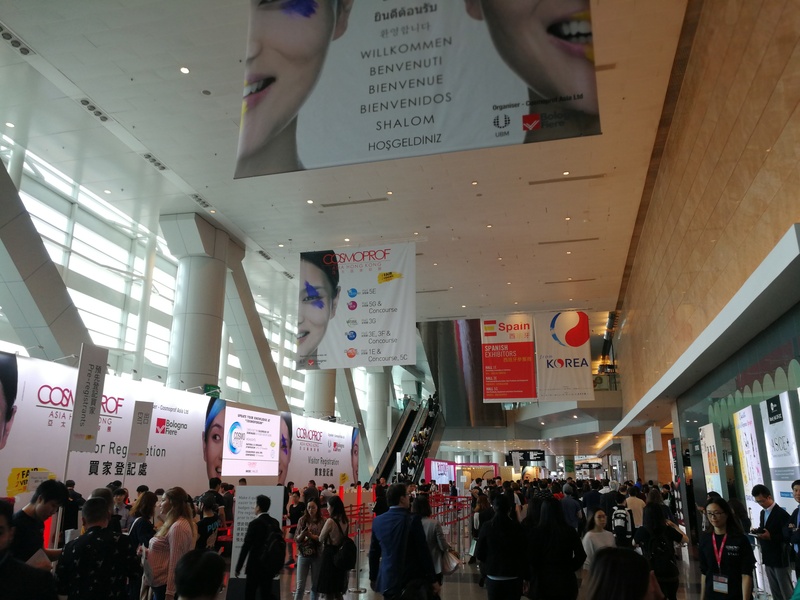 Hence Alibaba’s presence at Cosmoprof Asia. 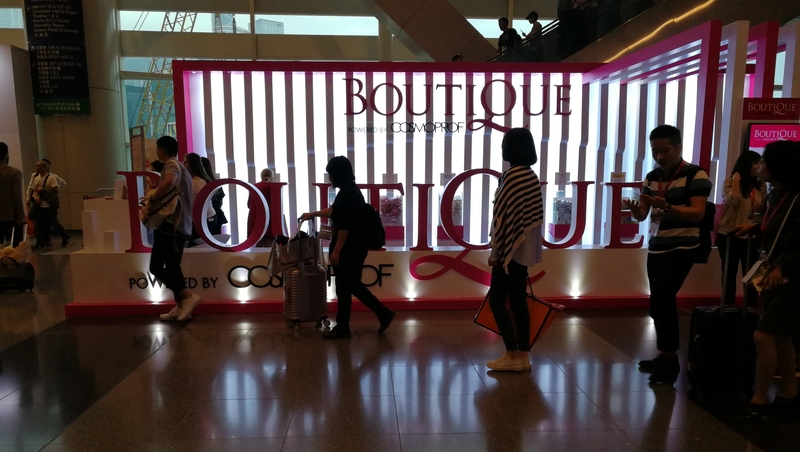 The pop-up store is designed to facilitate interaction between foreign manufacturers and the Chinese consumer, allowing Western beauty brands to communicate more directly and efficiently with their customer demographic. An integral part of the new retail concept are the Augmented Reality devices. The Makeup Mirror, see pic below, allows you to try out different makeup looks with products from a specific brand. The face in the mirror is that of the trade show visitor standing next to me, you can see her hands in the lower part of the pic. If you like a particular look/products simply touch the screen and a QR code will lead you directly to the brand’s online store on Tmall. There was also a skin care mirror (see pic above) which helps to diagnose skin conditions and problems and can then recommend specific products that are designed to tackle these problems. Tmall is rolling out this store concept to selected stores (primarily shopping malls and similar retail locations) across mainland China. 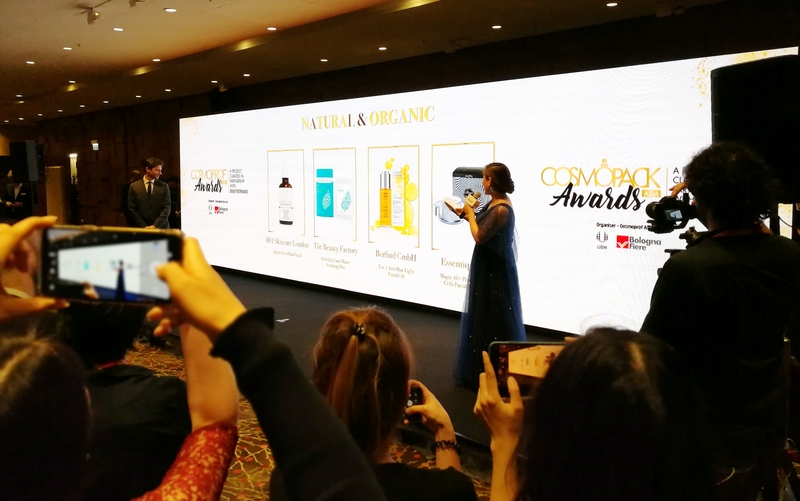 First of all: FINALLY an actual organic brand has won in the “Natural & Organic” category of the annual Cosmoprof Asia awards. Congratulations Annemarie Börlind! Annemarie Börlind is based in the Black Forest region of Germany; founded in 1947 by beautician Annemarie Lindner, distribution in 30 countries across the world – a very successful company and still family-owned. Their 3-in-1 Anti-Blue Light Facial Oil (the Awards winner) was launched a couple of years ago; it’s an orange-coloured oil blend based on jojoba oil, squalane, cacay oil and Himalayan cherry oil (dhatelo oil), with tagetes flower extract which acts as a natural blue-light filter. Hair Product: Physiocoiffeur Evolution Intensive Hair Booster Program (an anti-hair loss product) from Laboratoire Sintyl (Switzerland). Make-Up Product: Kuramoto-No-Shizuku Foundation (a foundation formulated with sake lees extract and rice germ oil) from Izavell (Japan). Nail Product: Idea’l UV-LED/LED Gel (a protective gel nail formula to help shield the natural nail plate against external damage) from Silcare (Poland). 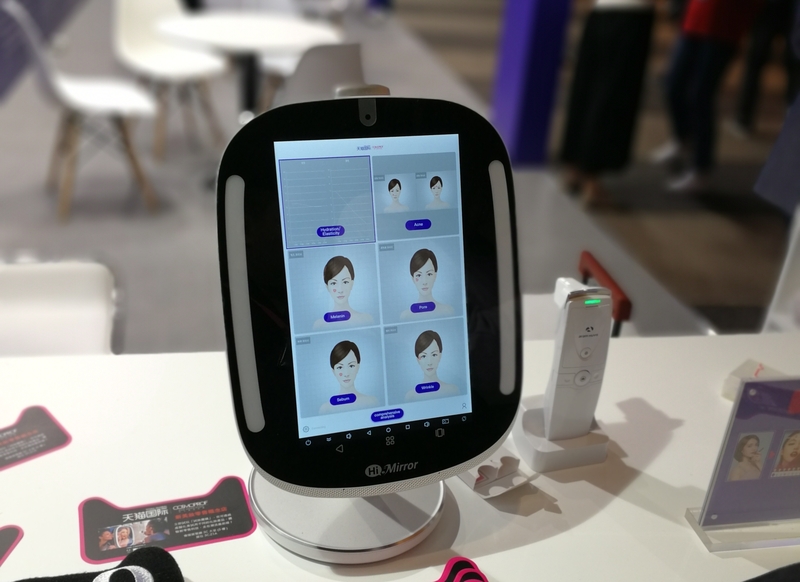 Skin Care Product: Lumini (a hand-held AI – Artificial Intelligence – skin analyzing device which can diagnose skin conditions and recommend suitable products) from Lululab (Korea).